Well, this is our last morning in Victoria Falls, Zimbabwe. We love this town and, of course, we love the waterfalls. 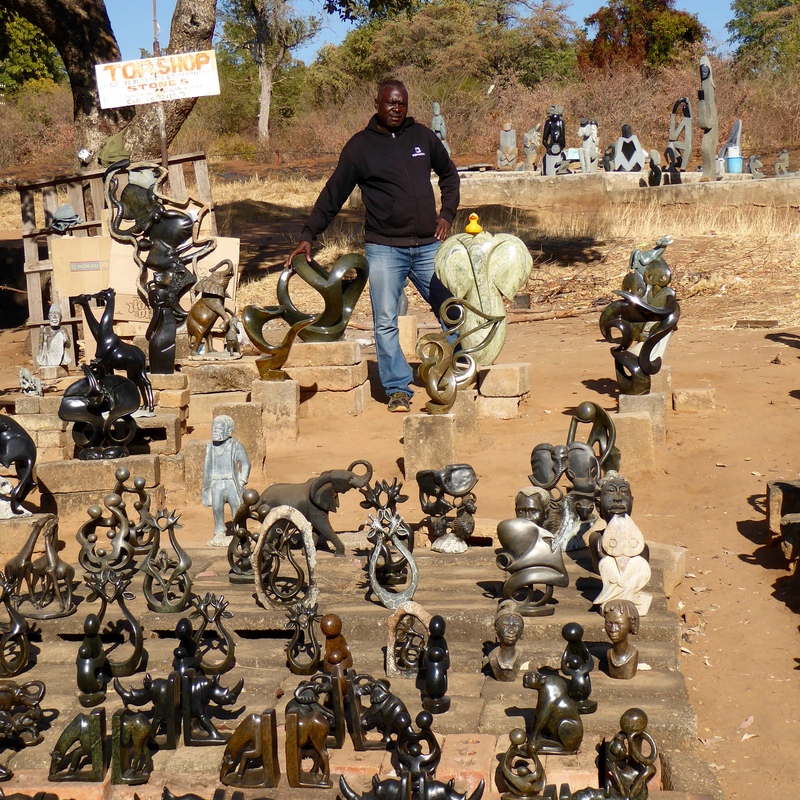 Our hotel was near an indoor craft market and an outdoor craft or curio market. This sign is for the indoor market. But, look what else humans can do here. I am glad mom did not try this. 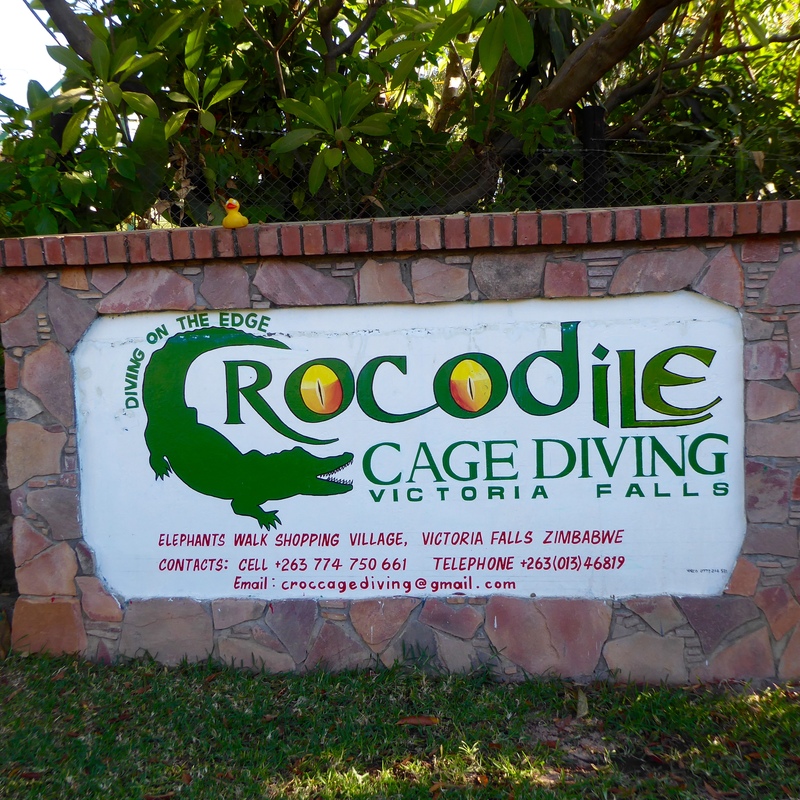 I don’t think this is the crocodile that would be a diving partner. 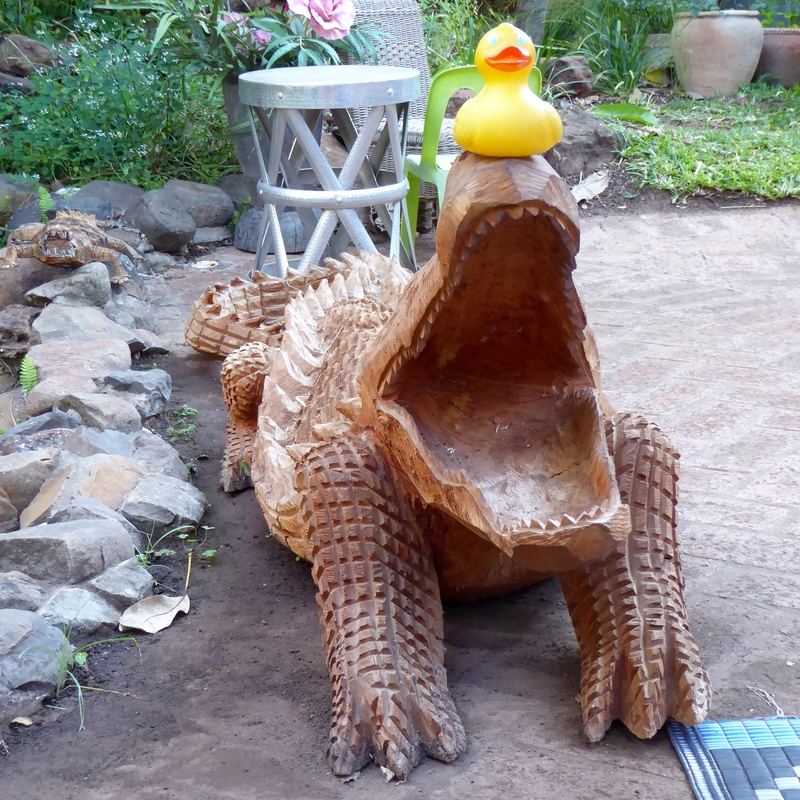 I do like this crocodile though. 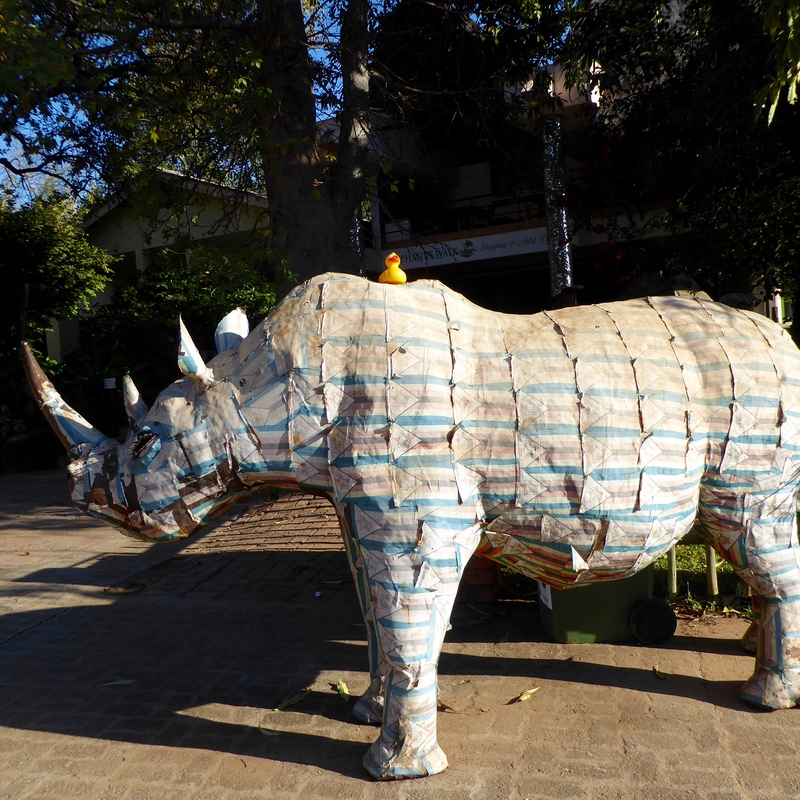 Isn’t this the most colorful rhino you have ever seen? It is a first for me, but in the middle of National Parks and game preserves, this rhino seems right at home. I even made a new friend here. 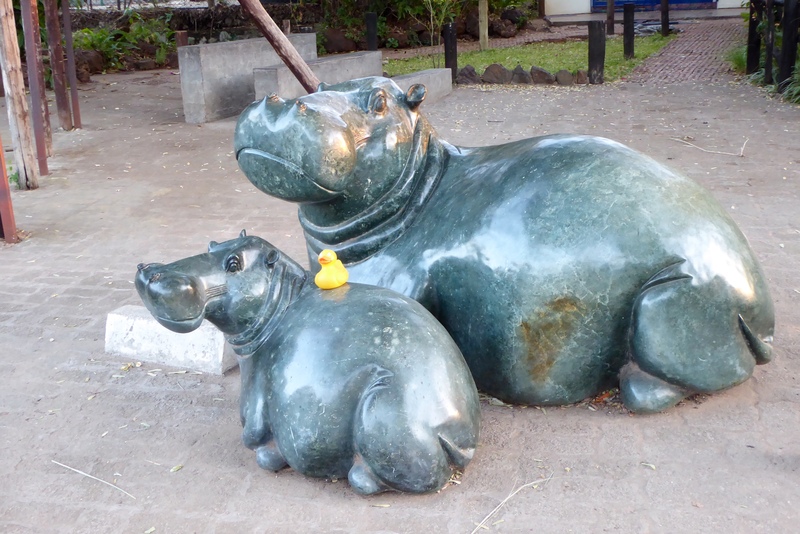 I have seen so many hippos in the water, but now I can sit on this one. Inside this market there are many nice craft stores and there is even a Fed Ex office here if you want to purchase items too large for you suitcase. We did not. Also inside there are various small market areas and individual stands. The cloth is for Chitenges. 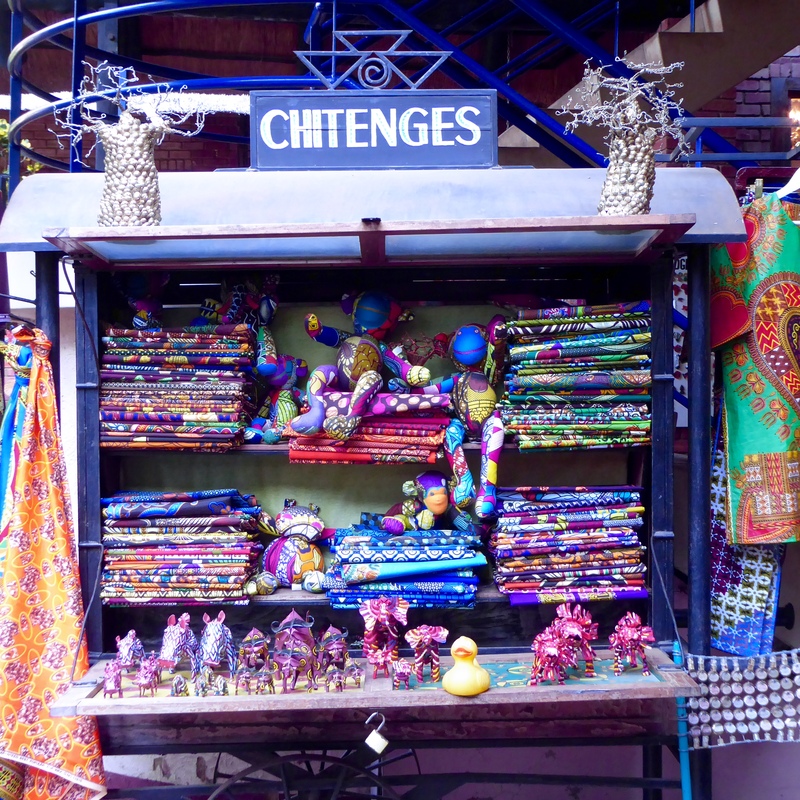 Chitenges are the cloth women buy and then wrap to make skirts. We think the material is very pretty, but we did not purchase any. We are waiting for our taxi to the airport, so we go outside. This vendor was very nice. He even asked mom to put me on some items for photos. Our taxi is here so the suitcase goes in and so do we. 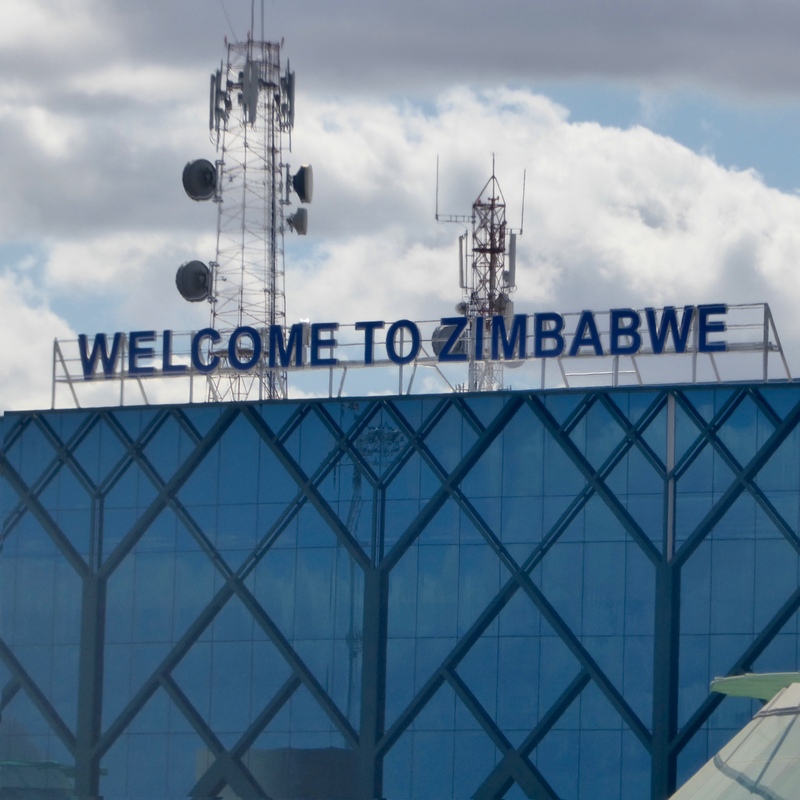 We are back at the Zimbabwe airport in Victoria Falls. Inside this aerial view of Victoria Falls is nice. We have plenty of time until our flight leaves. We do a little more shopping. 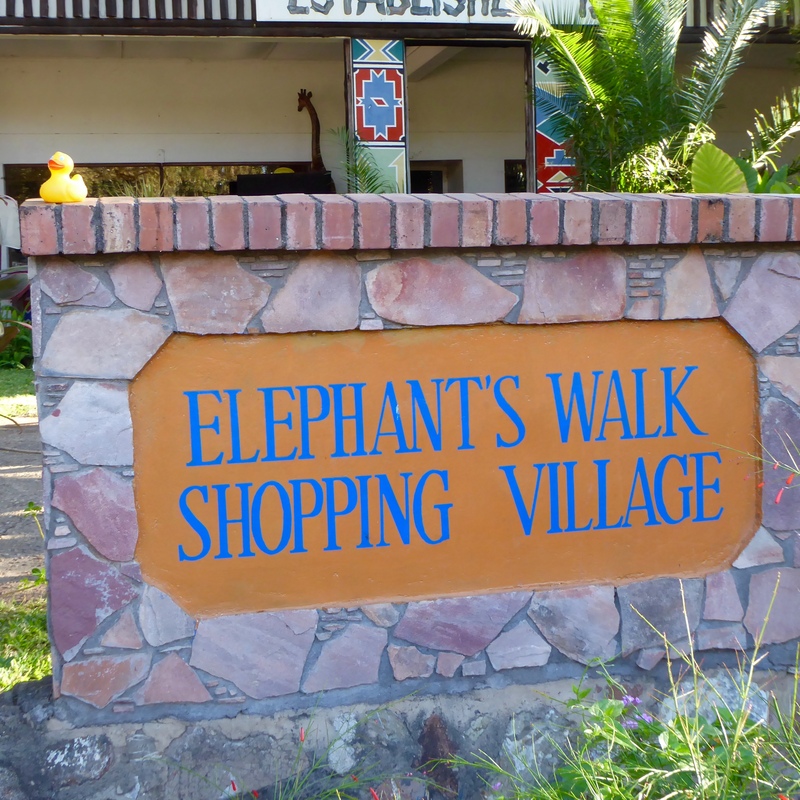 Mom likes the shops here and we purchase more souvenirs. 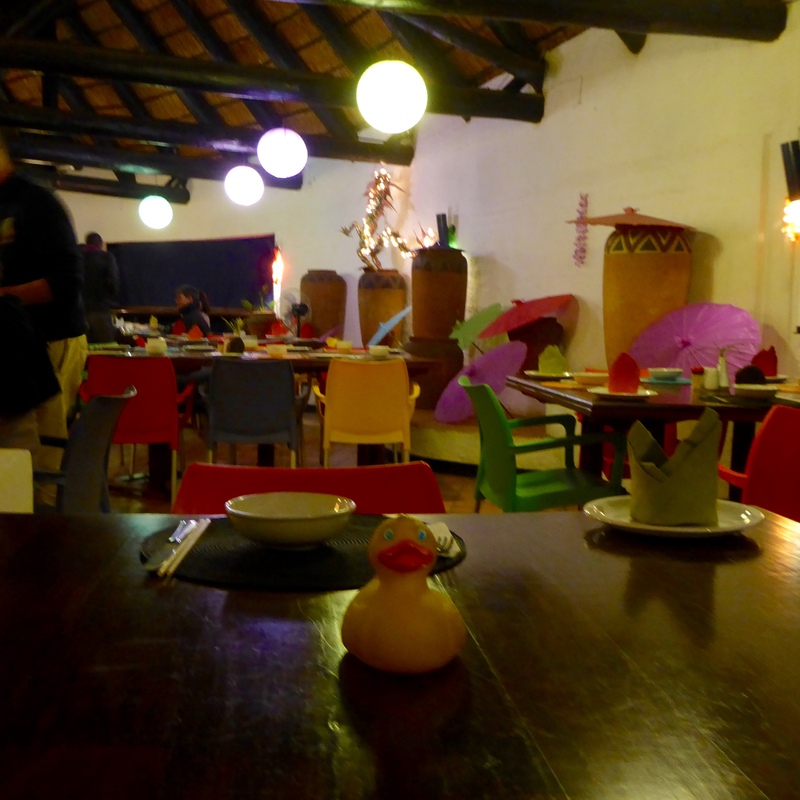 Then we enter the small restaurant in the airport. 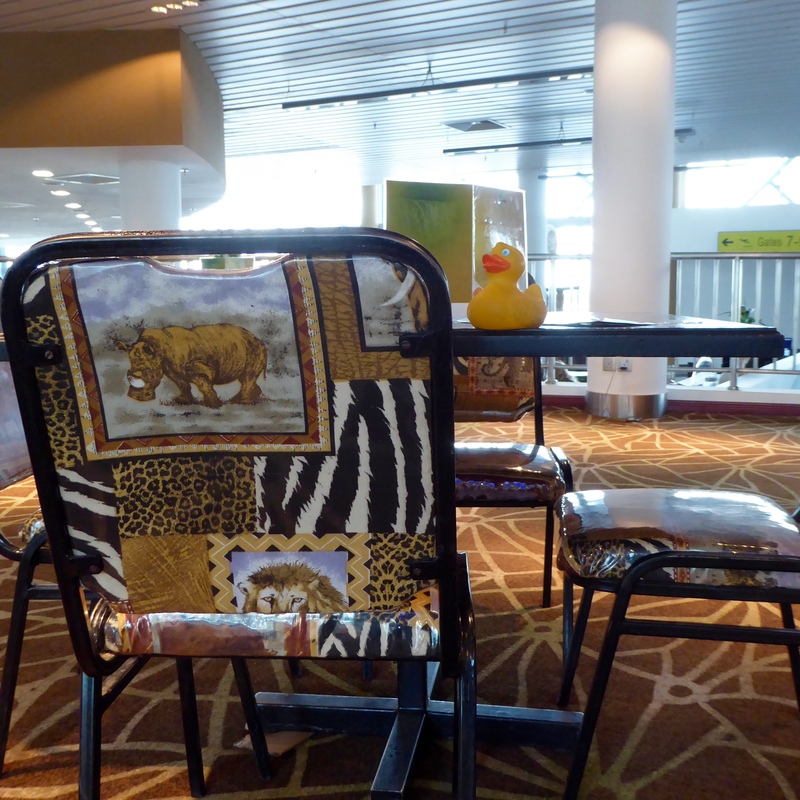 Even the chairs have African wild animals. Crocodile burger? We ask the waitress about it and she says it is good. And, of course, it tastes like chicken. 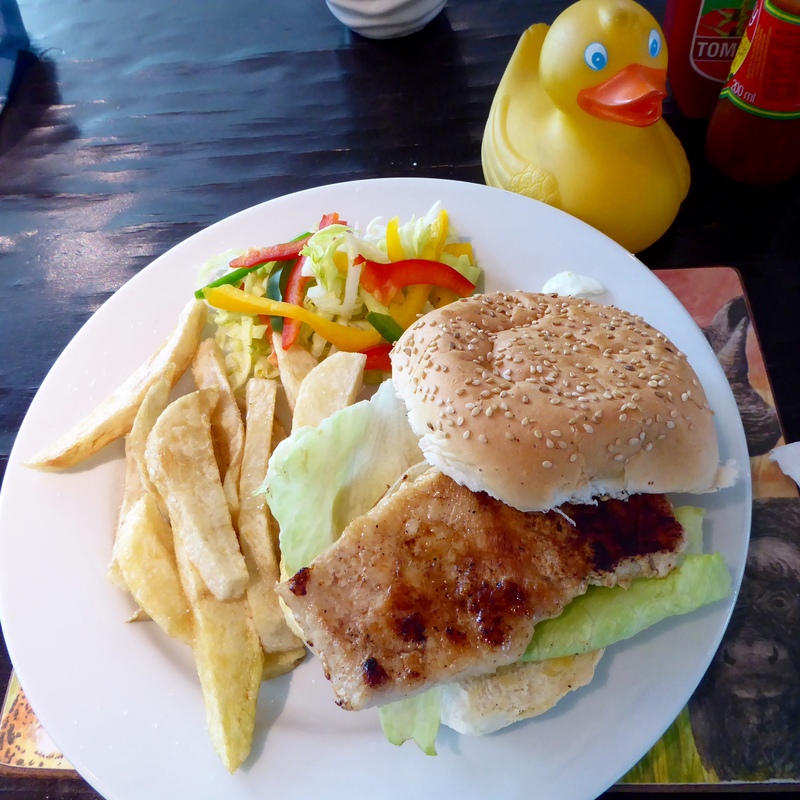 We have never had a crocodile burger; never have seen it on a menu either. Mom has eaten crocodile nuggets in South Africa and crocodile appetizers, almost like shoe string potatoes in Denver, but never a burger. 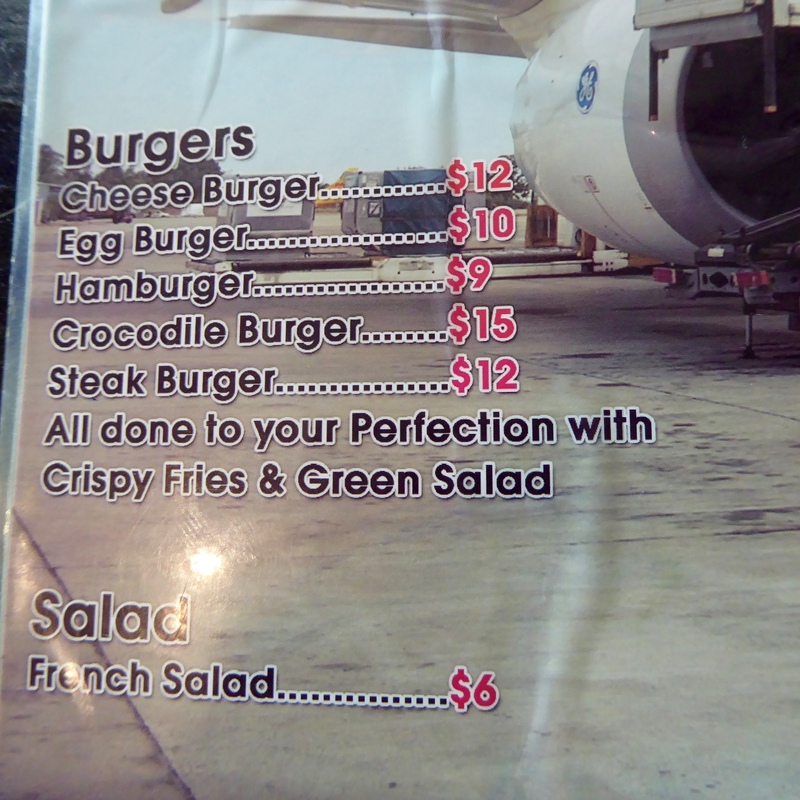 So, we order the crocodile burger. It is very good, and it does taste like chicken. However it is much more dense or heavy than chicken. We liked it, but we may never see it again on a menu. And for the curious, the official currency of Zimbabwe is the US Dollar, so yes, we did pay $15 for a crocodile burger. Our flight is called now, so next time we will be in Mozambique. More adventures to come. 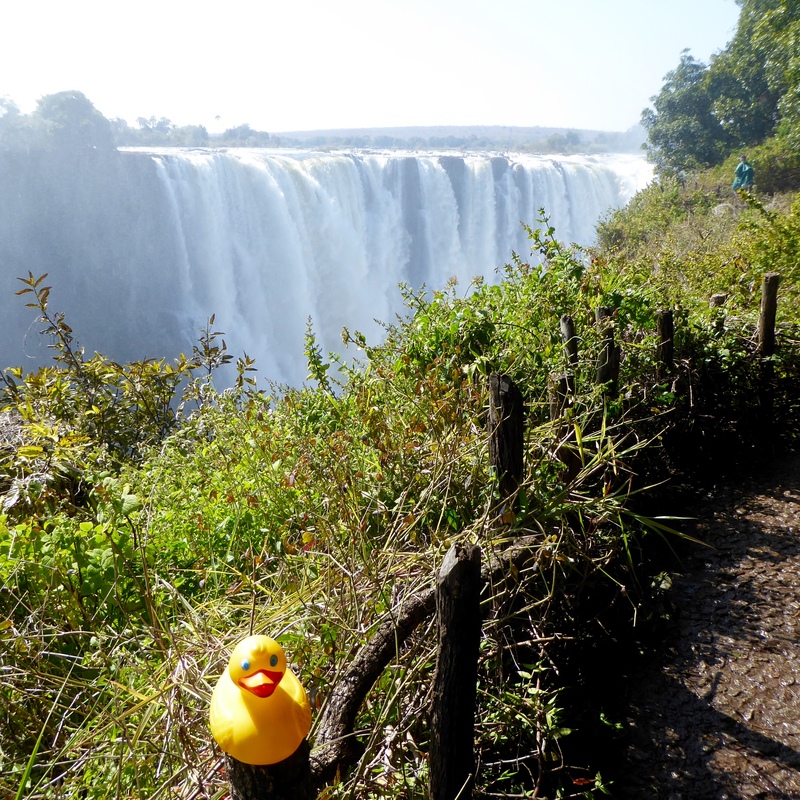 Our time at Victoria Falls is almost over, so today we will walk to Zambia to see the falls from that side of the river. 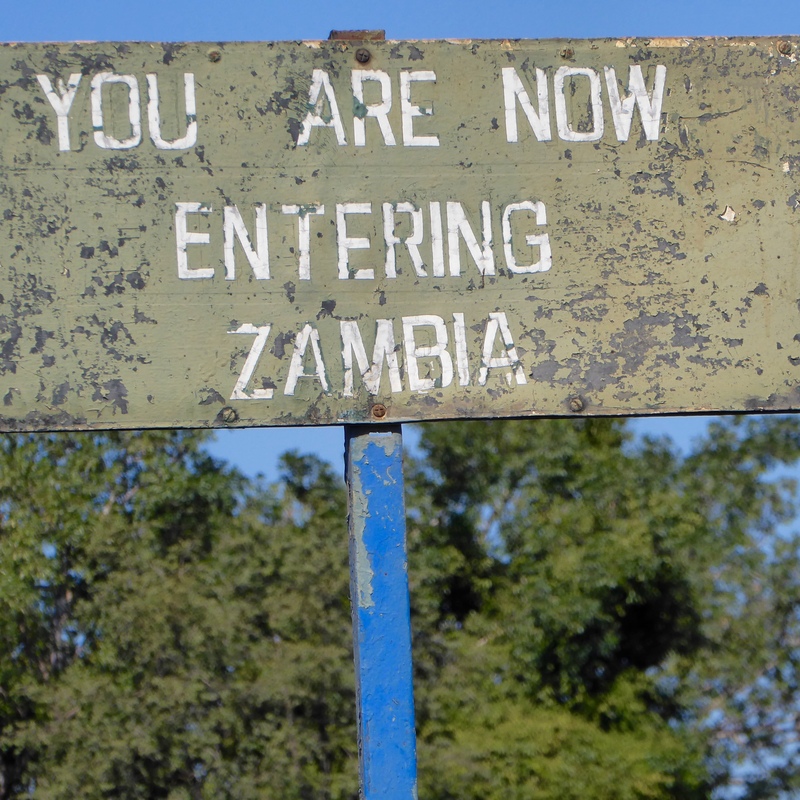 We passed Zimbabwe’s Victoria Falls National Park and walked to Zambia. 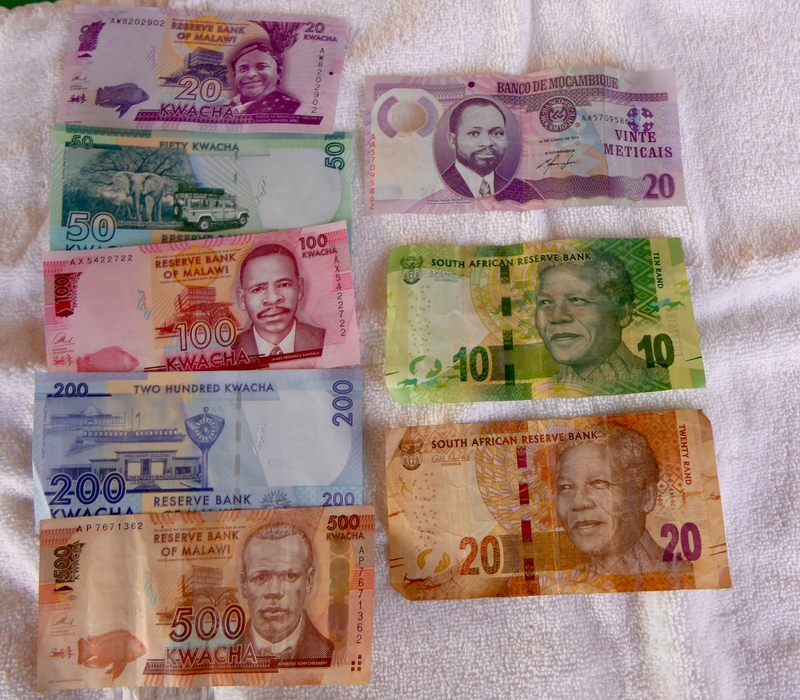 Since we were exiting one country and entering another, we stopped for immigration in each country and paid a fee to visit the destination country. 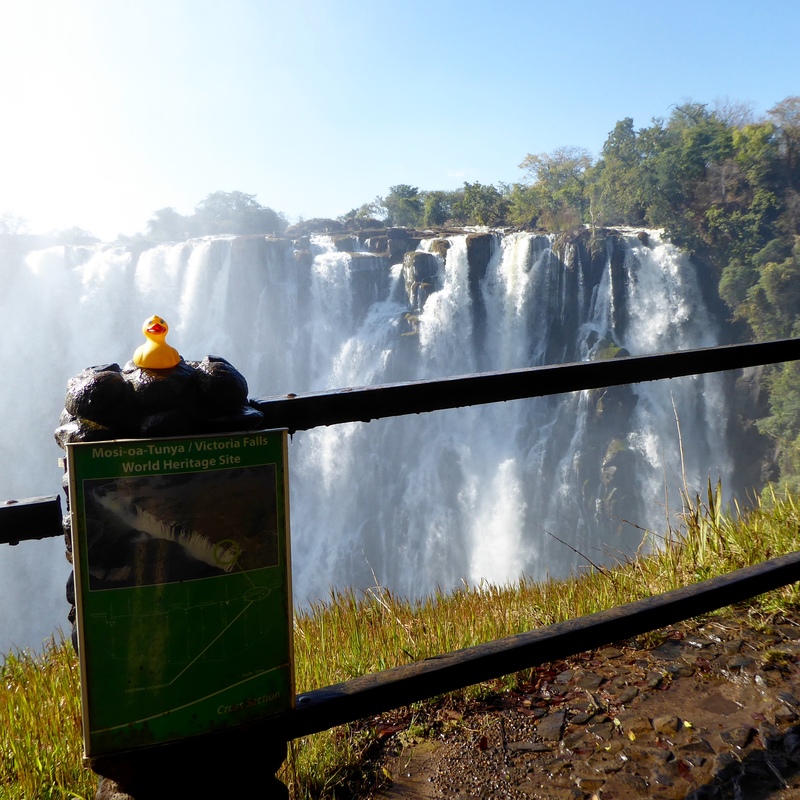 We stop often to view Victoria Falls from Victoria Falls bridge. Isn’t it beautiful? 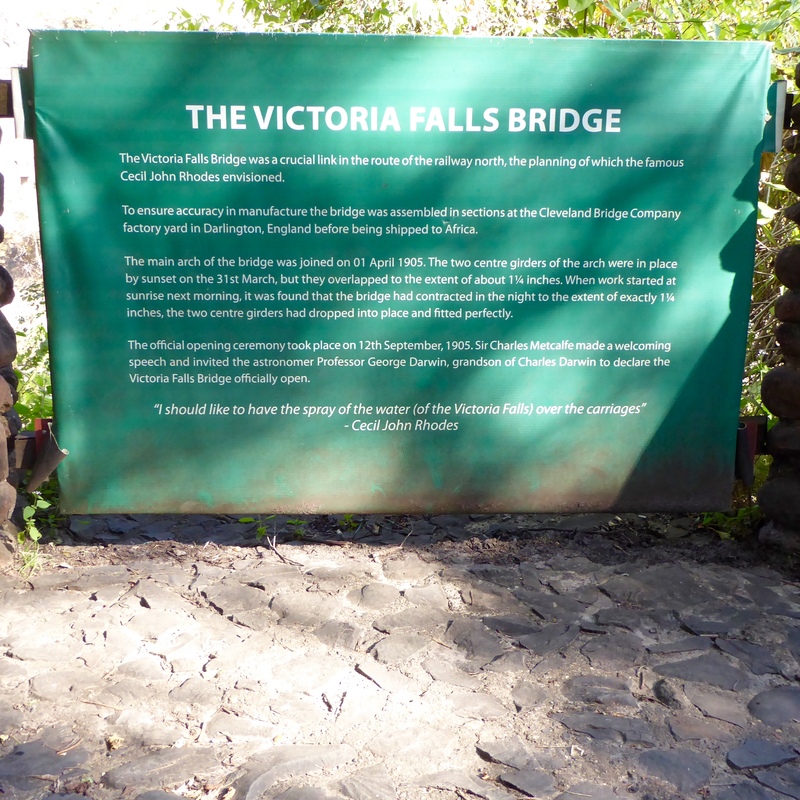 Victoria Falls Bridge is famous. The span of the arch is 158 meters. 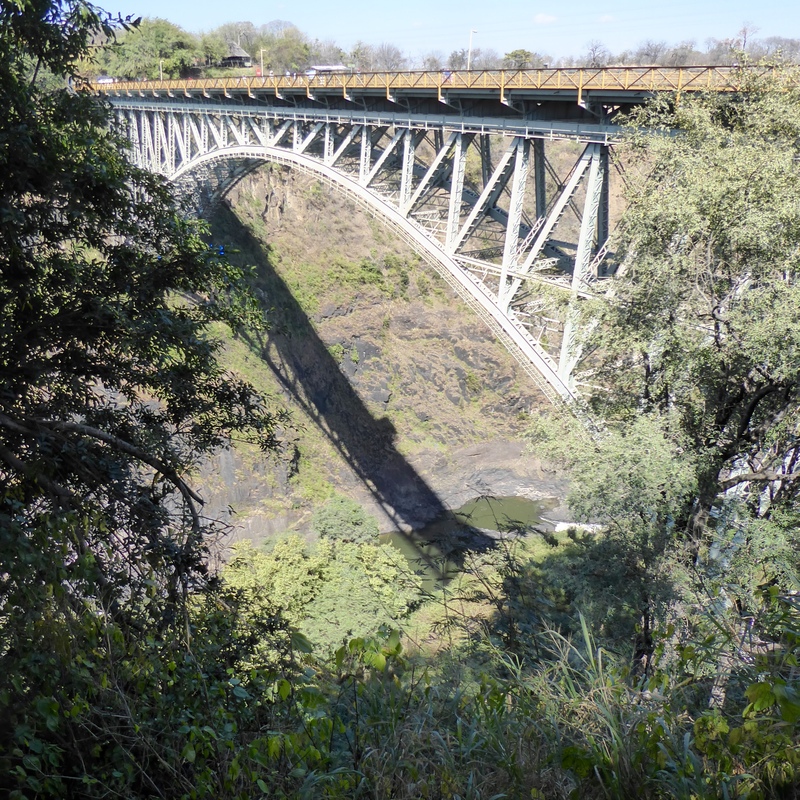 The bridge is 128 meters above the Zambezi River at low water. 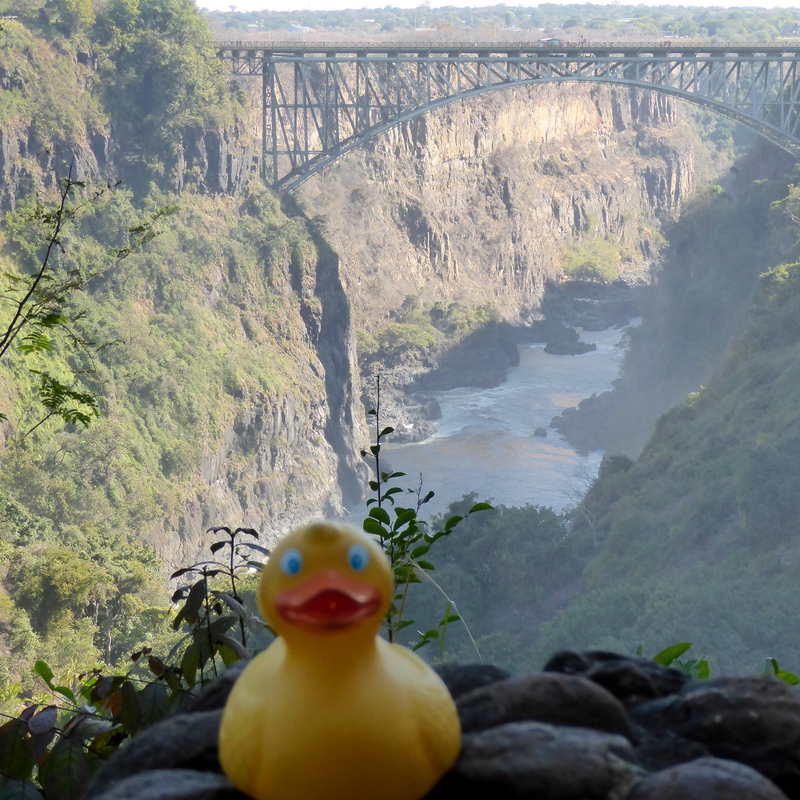 And, this Victoria Falls Bridge is one of only a few bridges in the world that carries road, rail and pedestrian traffic. And has great views of Victoria Falls. 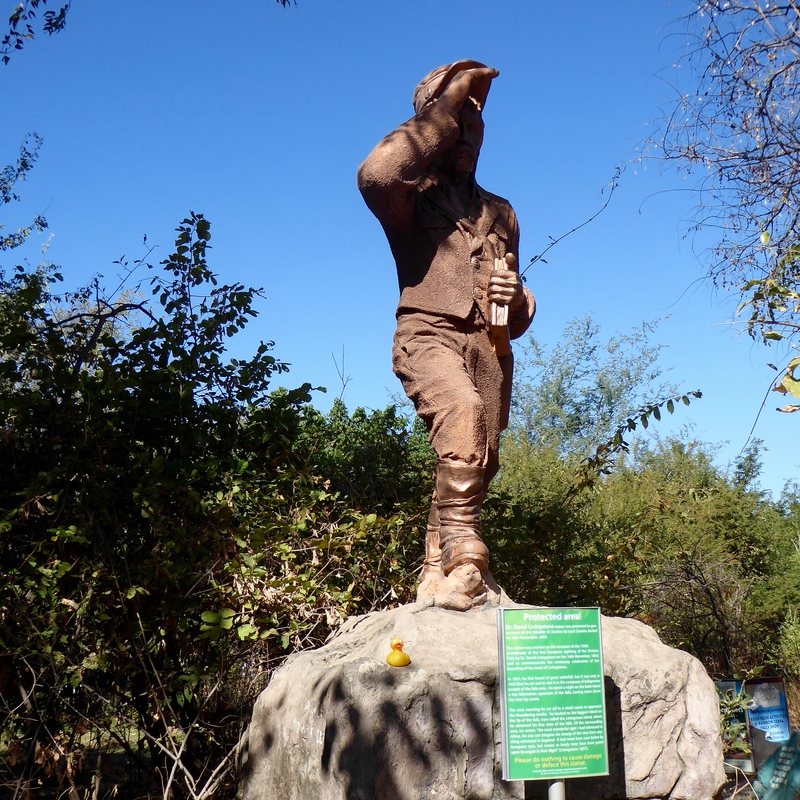 Just inside Zambia, we see this statue of Dr. David Livingstone. 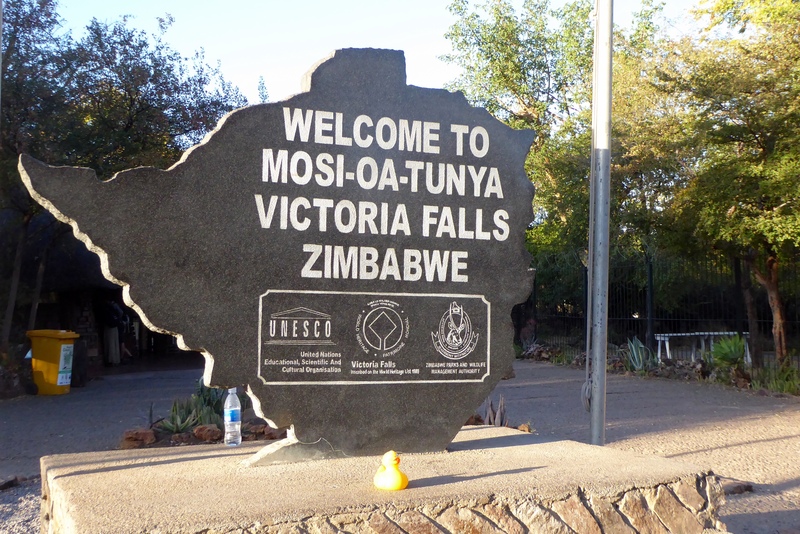 This statue, dedicated November 16, 2005, commemorates the 150th anniversary of the first sighting of Victoria Falls by a European. 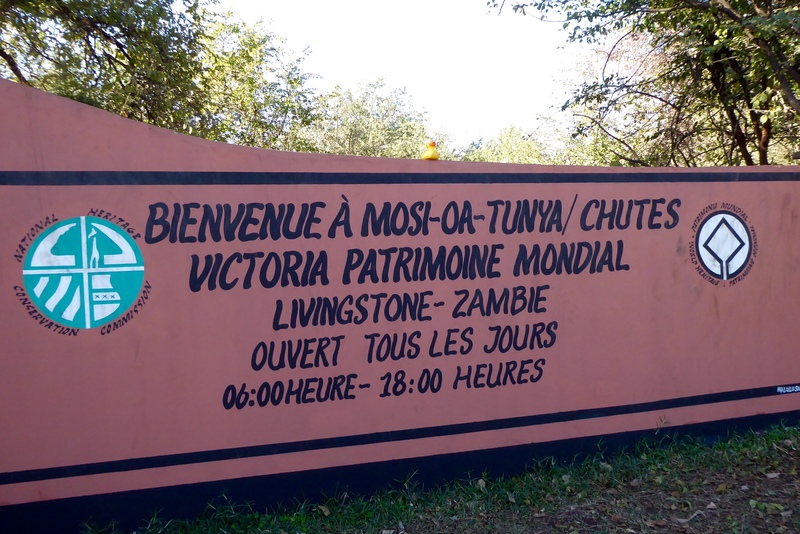 Dr. Livingstone reached Victoria Falls November 16, 1855. 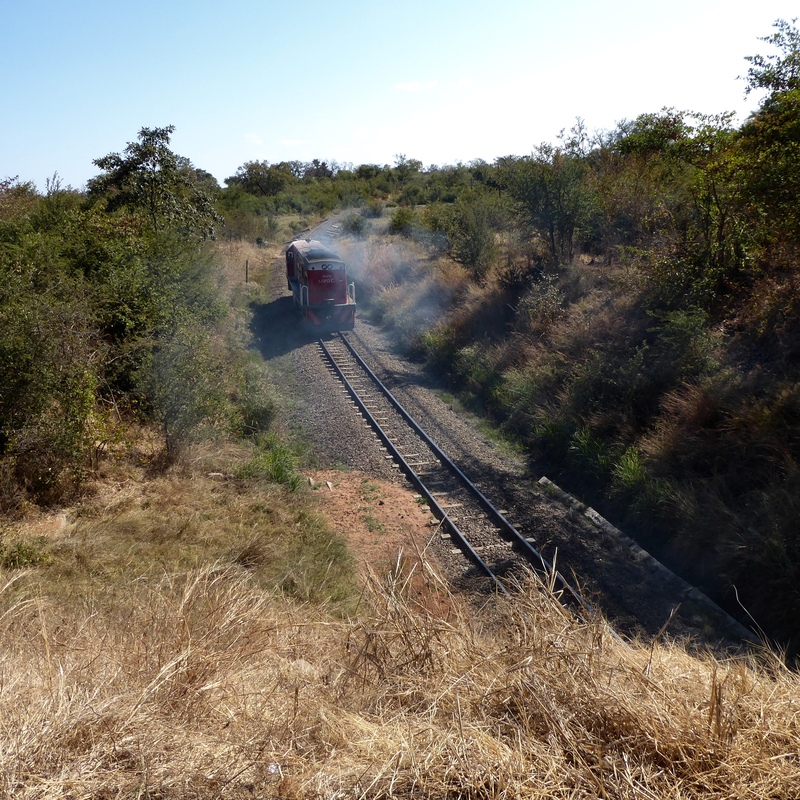 We enter Zambia’s National Heritage Conservation Commission area. We purchase our ticket and rent another raincoat. This is a view of the Victoria Falls bridge from inside the park area. 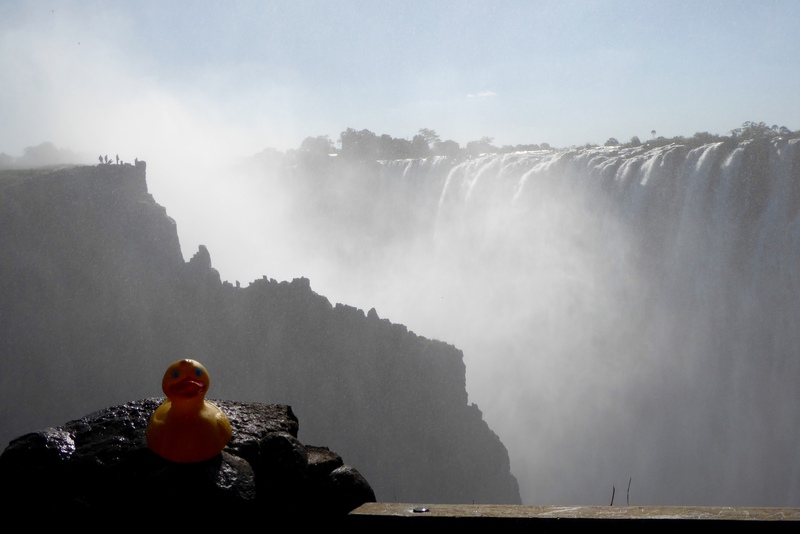 We follow the path along the falls, delighting in each view of Victoria Falls. We will cross this foot bridge, but see how wet it is. Walk over this bridge. Spray from falls keeps everything and everybody wet. The mist and spray from Victoria Falls is very strong. This is Rainbow Falls. Isn’t it spectacular? We love rainbows and water, so this is perfect for us. These waterfalls are beautiful and we are captivated by them. Leaving the park, we like this sign. 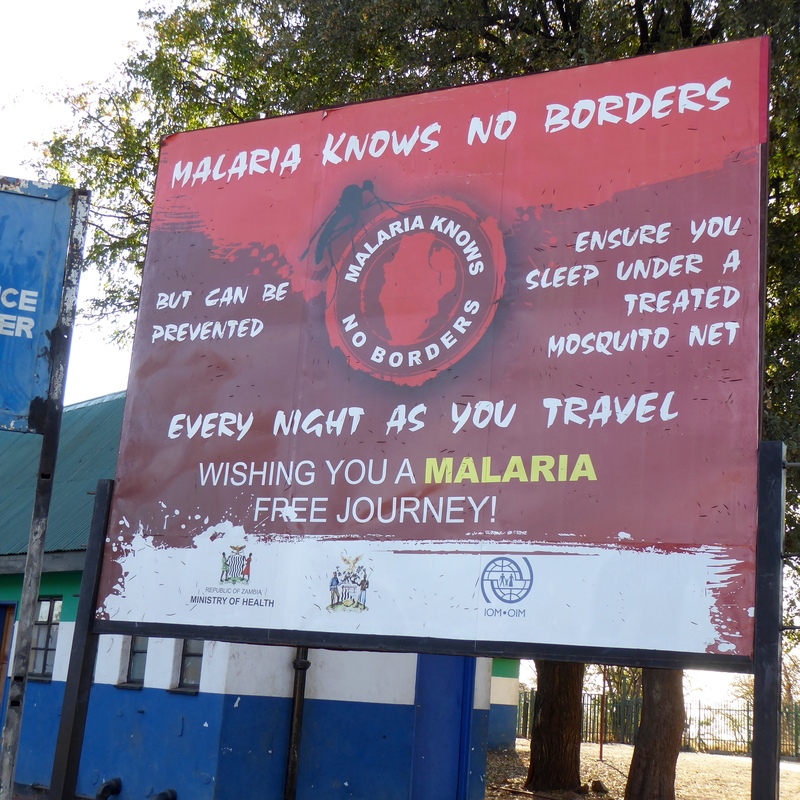 Malaria kills many people. We take our daily pills and use mosquito netting. 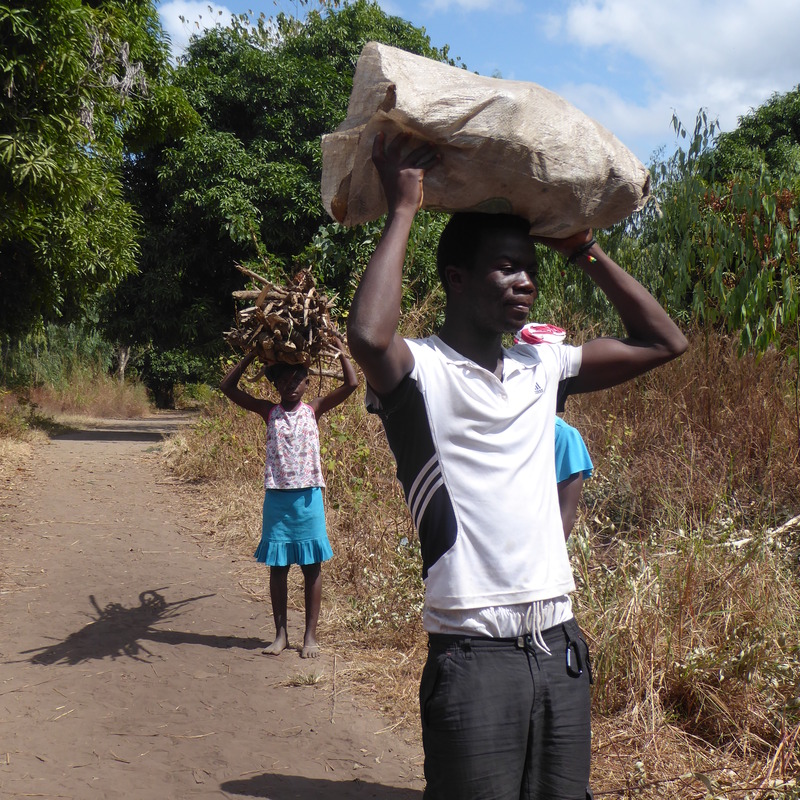 We hope all people in Africa use the mosquito netting also. We bought a couple t-shirts and are carrying them in a bag. 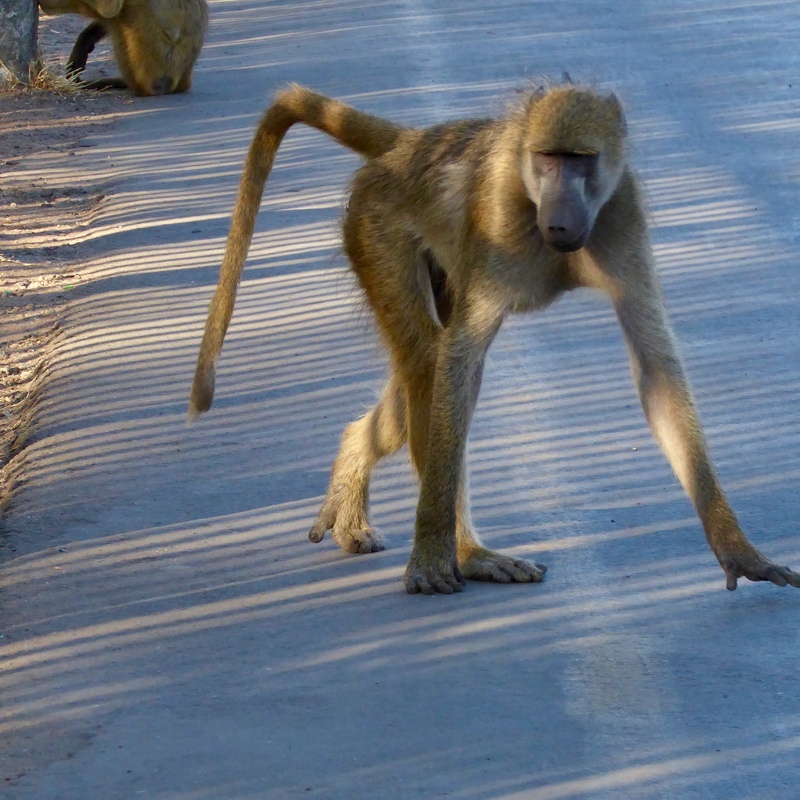 As we cross Victoria Falls bridge to return to Zimbabwe, we see this baboon on the bridge. He is coming to us. What??? He runs to mom, jumps up and grabs the t-shirt bag. He rips the bag, but then leaves the bag and us because there is no food in the bag. No one is hurt, but we are certainly surprised. Is this an almost baboon attack? These baboons are really friendly. That was a new experience and a great story to tell our friends at home. Looking at the waterfalls, we recognize the foot bridge we crossed in the park. 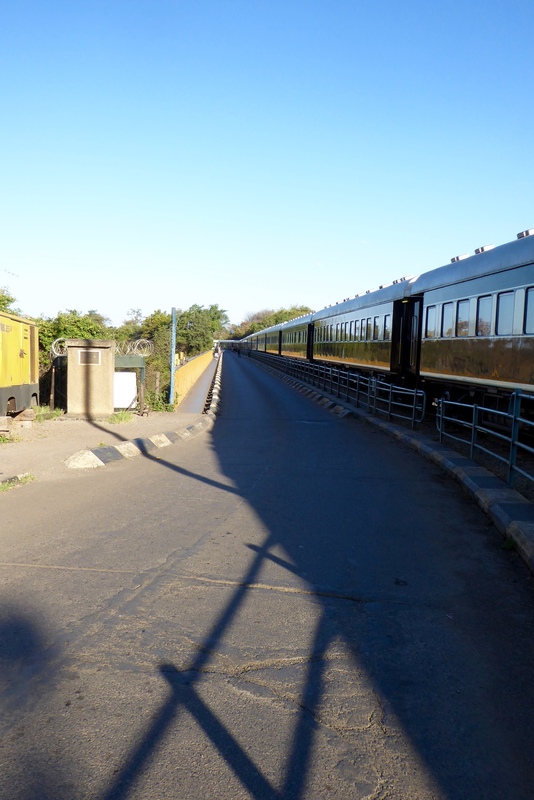 While we walk across the bridge, a train, Pride of Africa, is also crossing the bridge. This is our last full day at Victoria Falls. 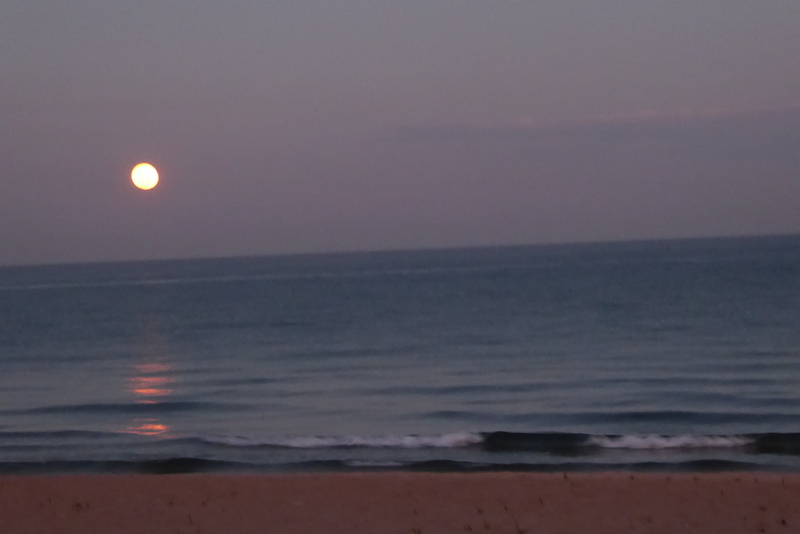 We really wish we had more time, but we have plane reservations and hotel reservations in Mozambique. 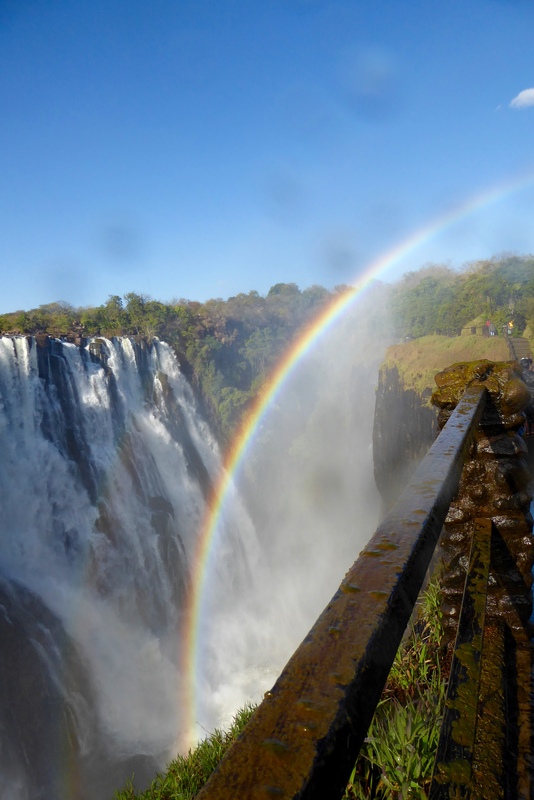 If you visit Victoria Falls, we know you will love it. 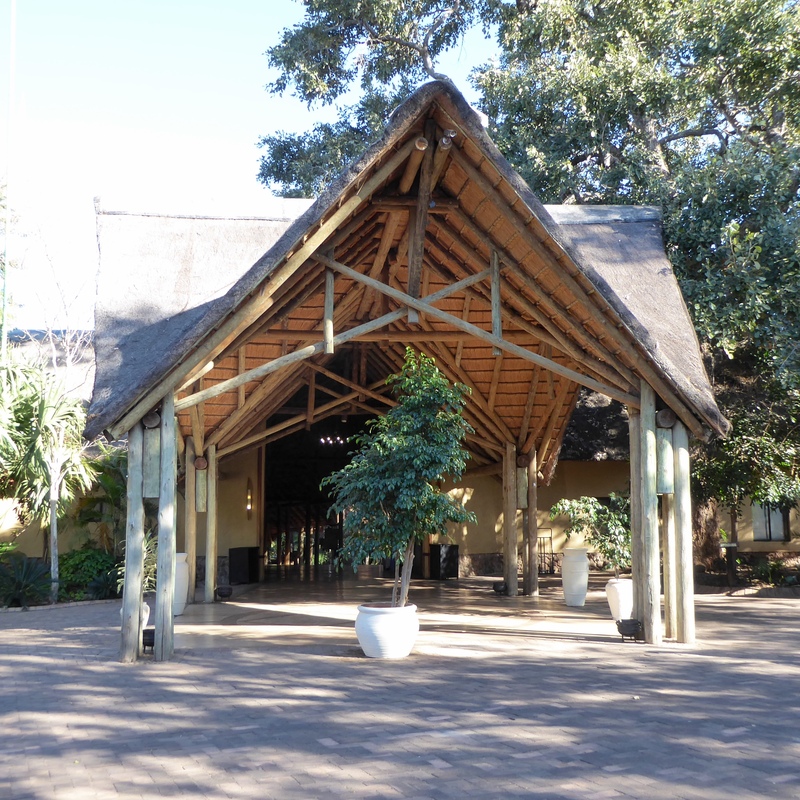 We are still in Botswana at Chobe Safari Lodge. The river safari and lunch were fantastic. 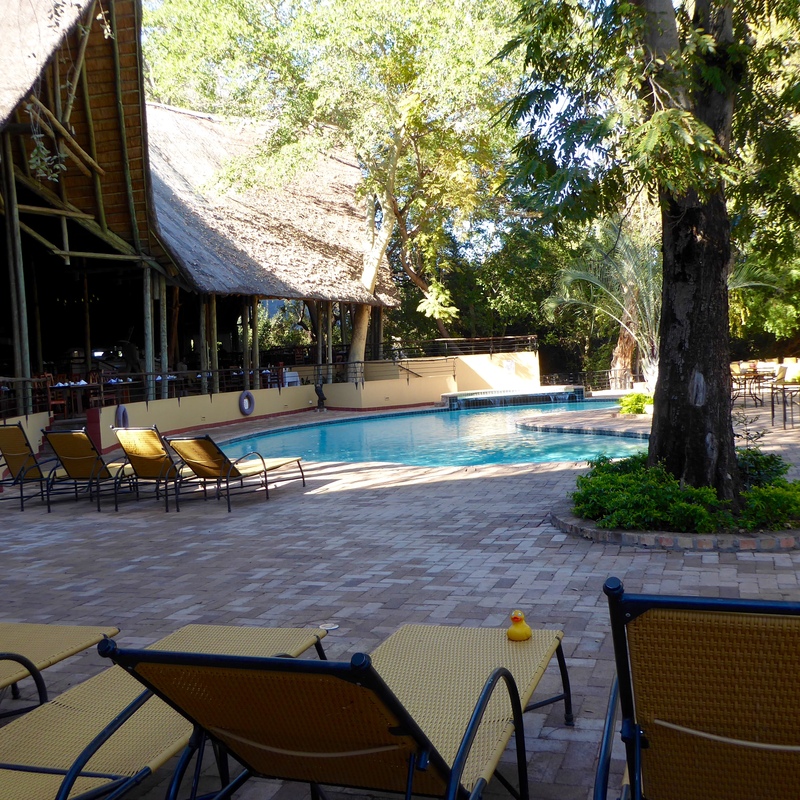 We loved eating by the pool and the Chobe River. 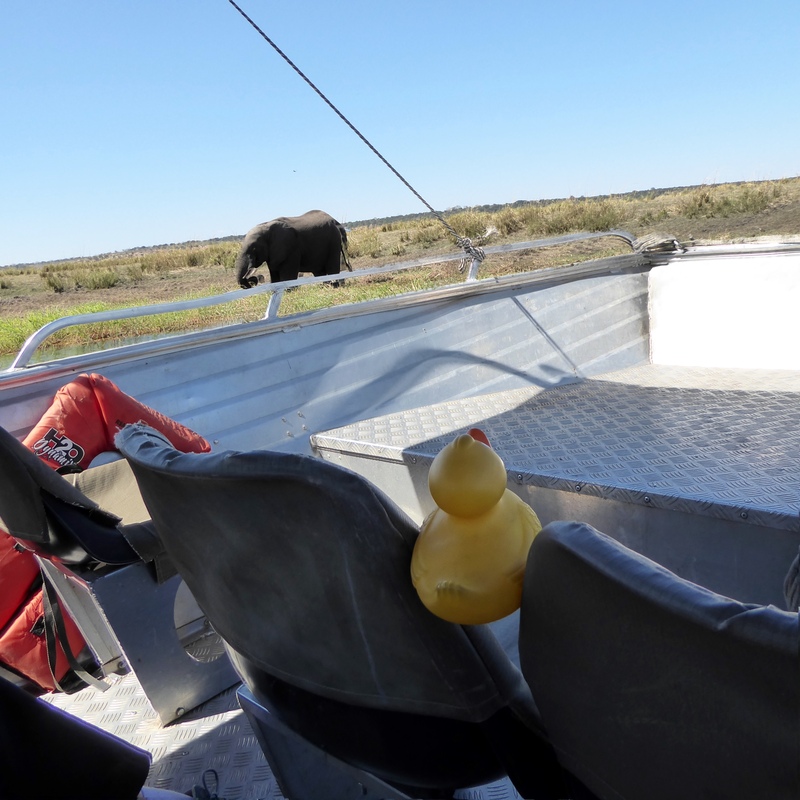 On this safari, the humans agreed that they had seen enough birds, impalas and warthogs. They were looking for zebras, giraffes and lions. But they did want to stop to admire other large animals. An early stop was to gaze at these rocks. Large rocks? Not at all! 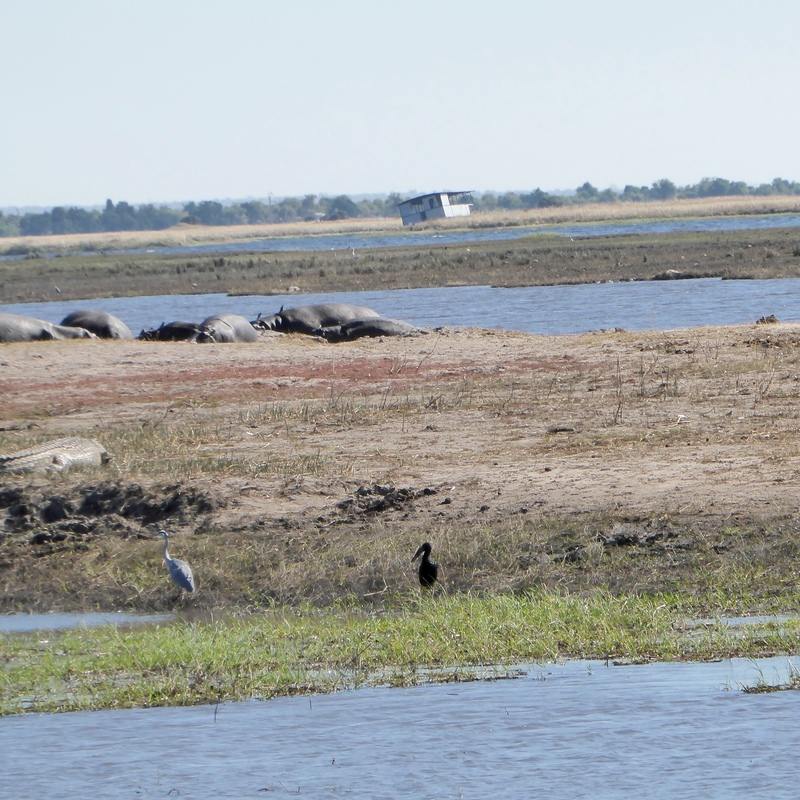 Oh, they are not rocks, they are resting hippos. 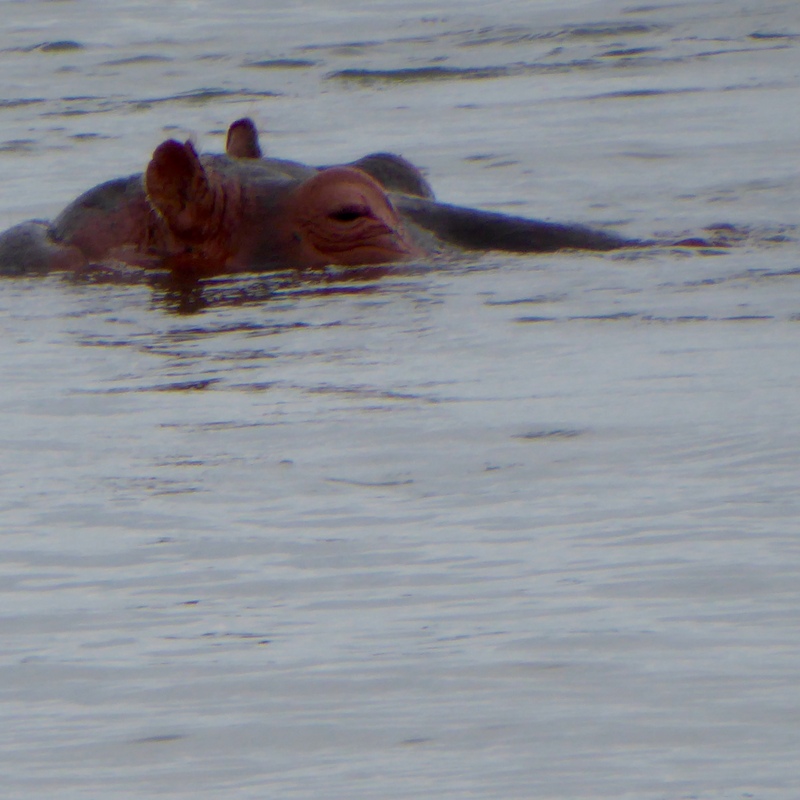 Hippos are so big, but they can run really fast. 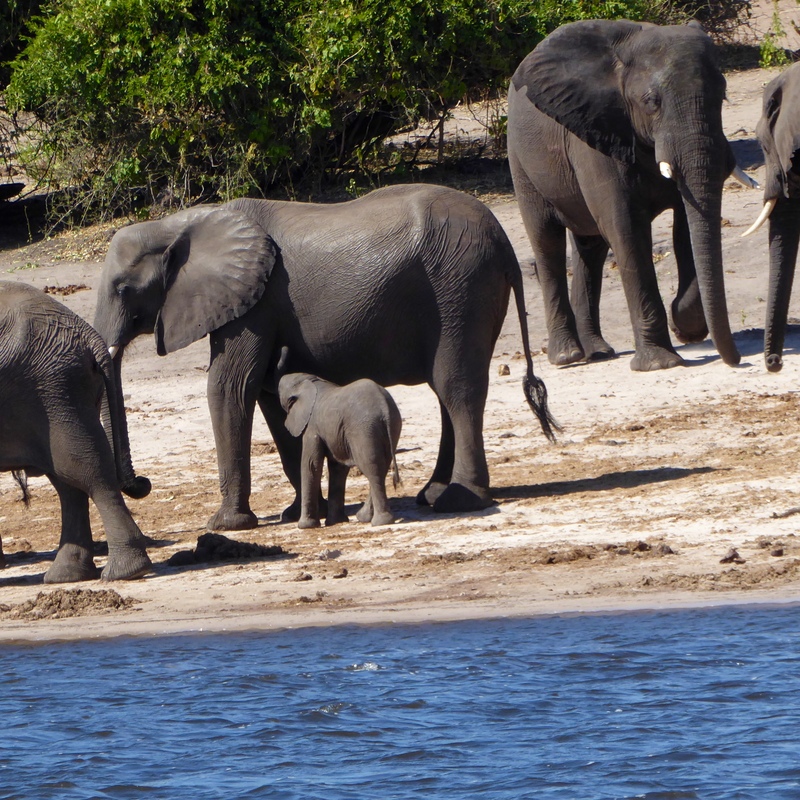 Remember the elephants we saw on the boat safari? Well, here they are again. Those two babies are so cute. Mom was having a little problem getting them to move quickly enough, so mom’s tusks bumped into the youngster’s rumps if they got too slow. That seemed very effective. 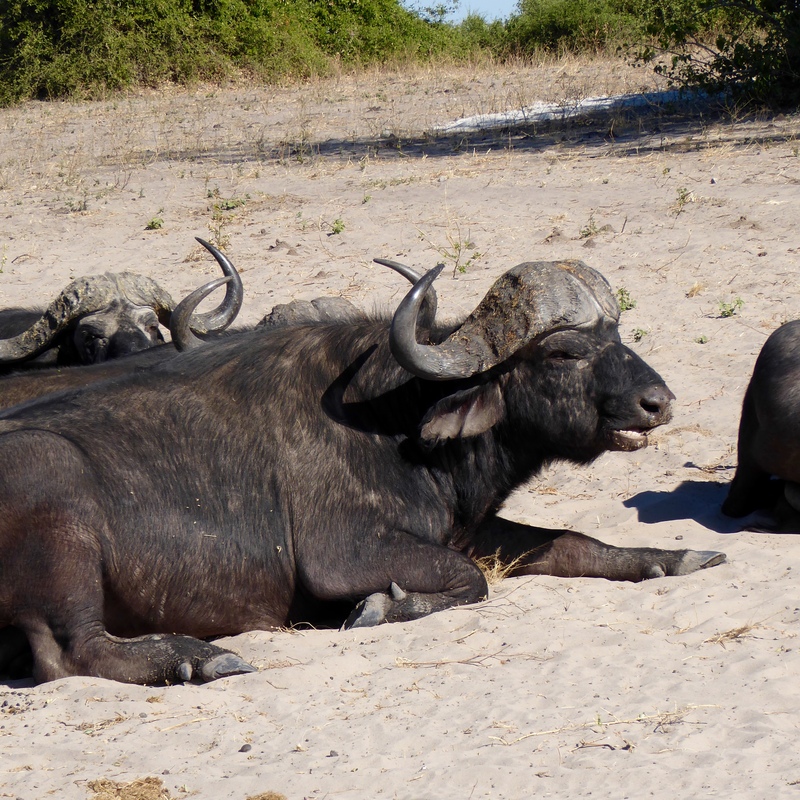 Cape buffalo are also very big. The humans did say they wanted to stop for big animals. Alright, this is a new animal for me, Zeb the Duck. 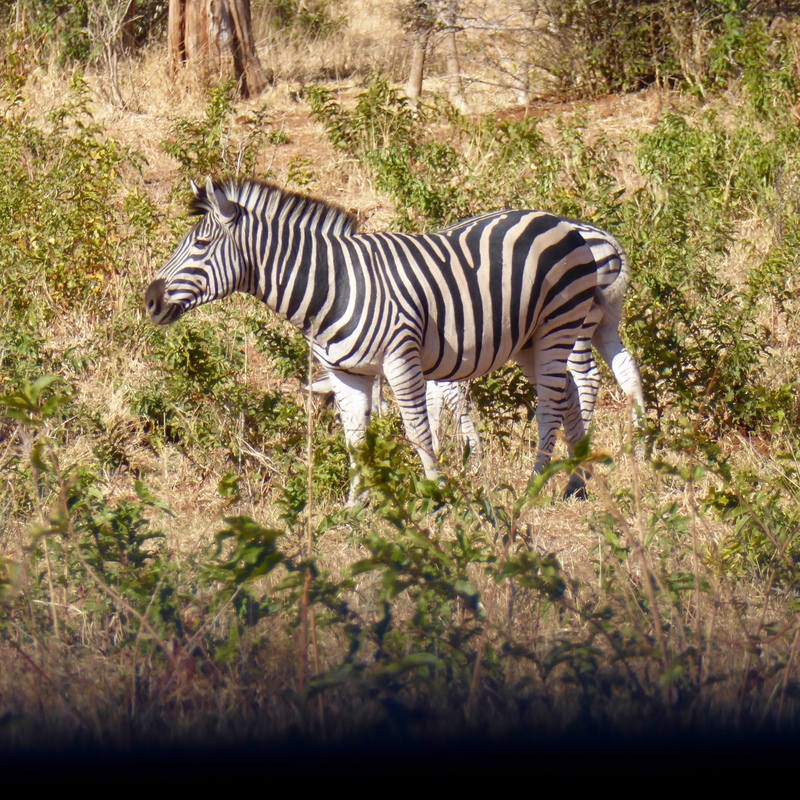 This is my first wild zebra. We saw a small herd of them, and what are these animals near them? Wow. 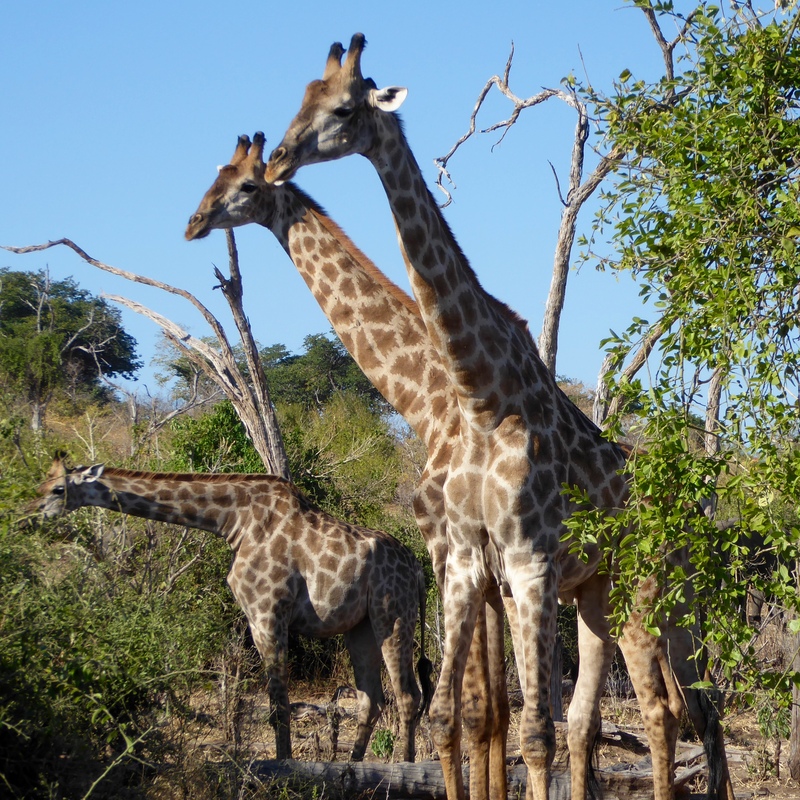 These tall guys are giraffe. My first wild giraffe also. Oh look. 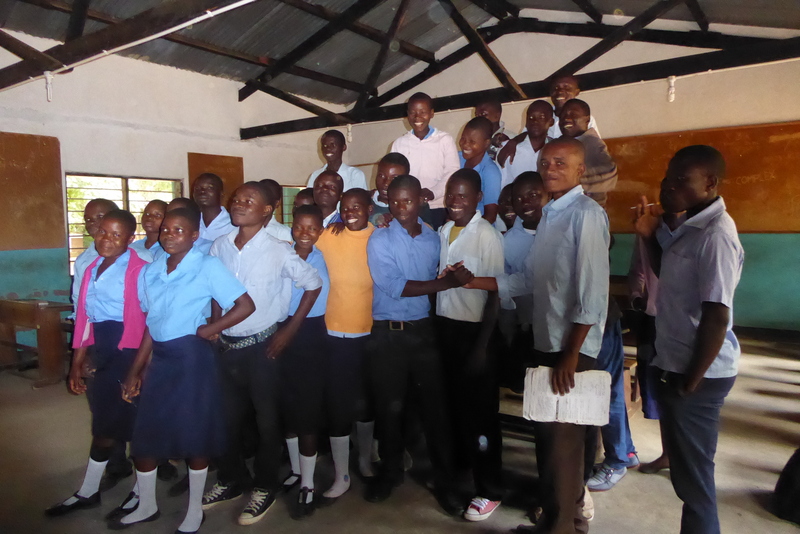 To the right, near the center of the photo, there is a young giraffe. Shorter, but certainly not short. I don’t believe I have seen this one before, either. 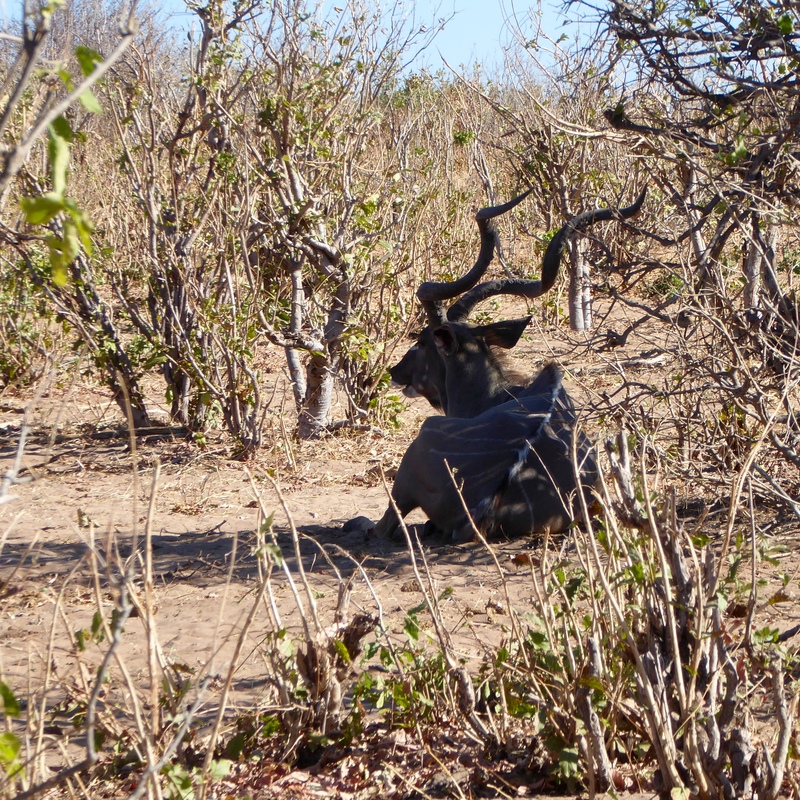 This is a kudu. Very impressive twisted horns. 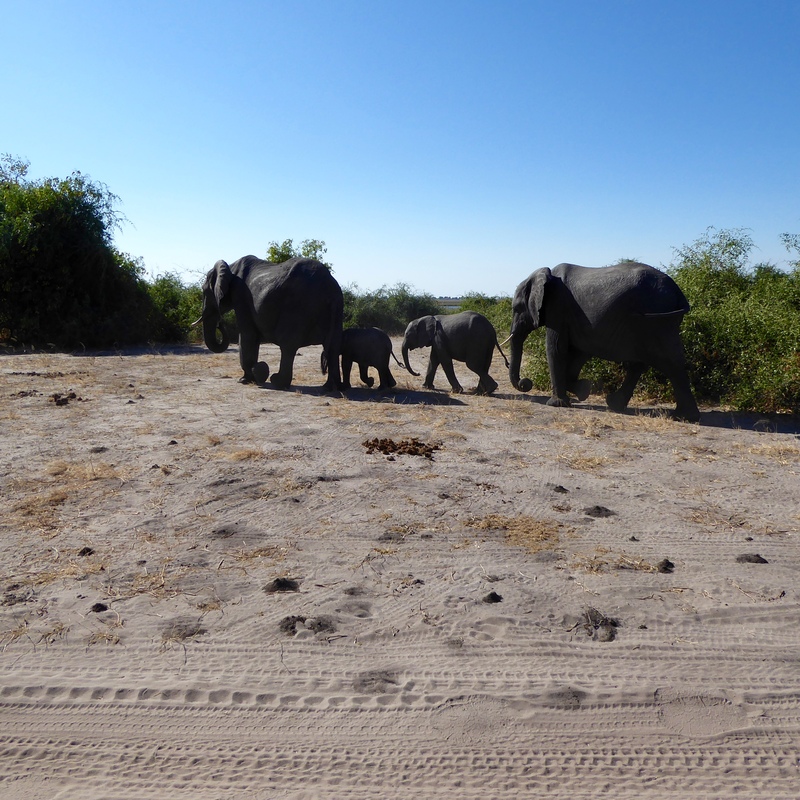 Well, our game drive in Chobe National Park in Botswana has ended. It was great, but we did not see the big cats. No lions, no cheetahs, and no leopards. 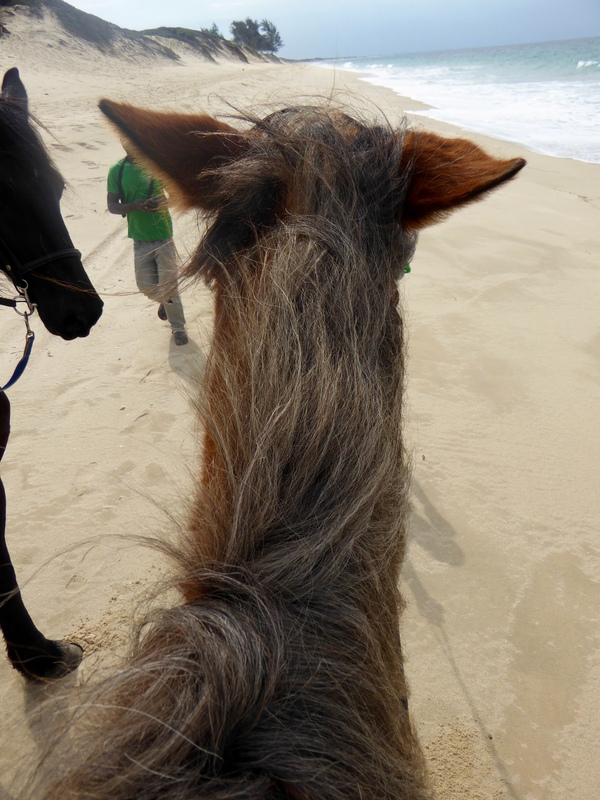 But we did see so many magnificent animals. 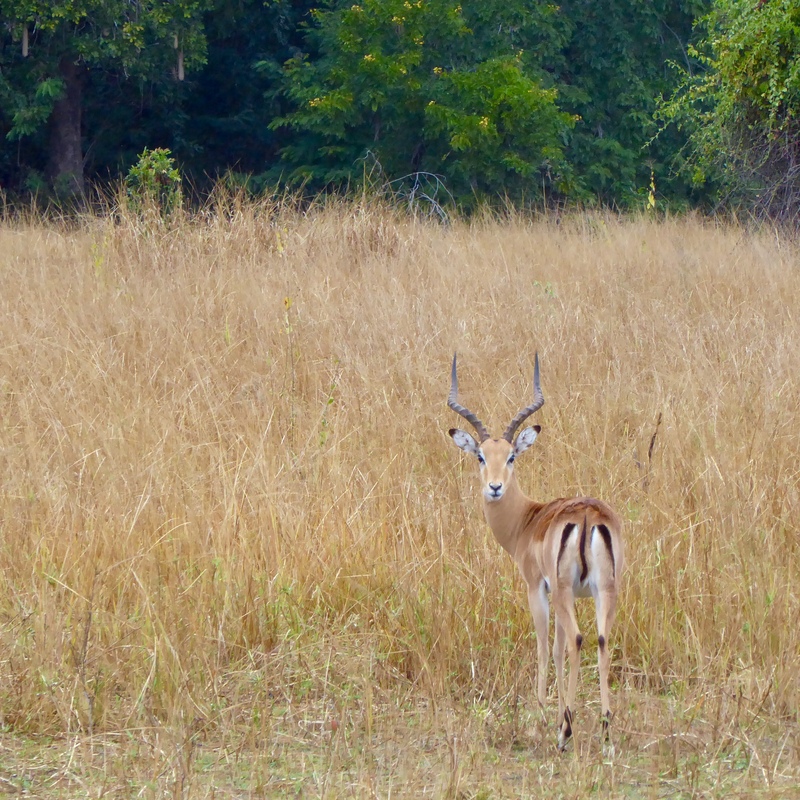 I love safaris. 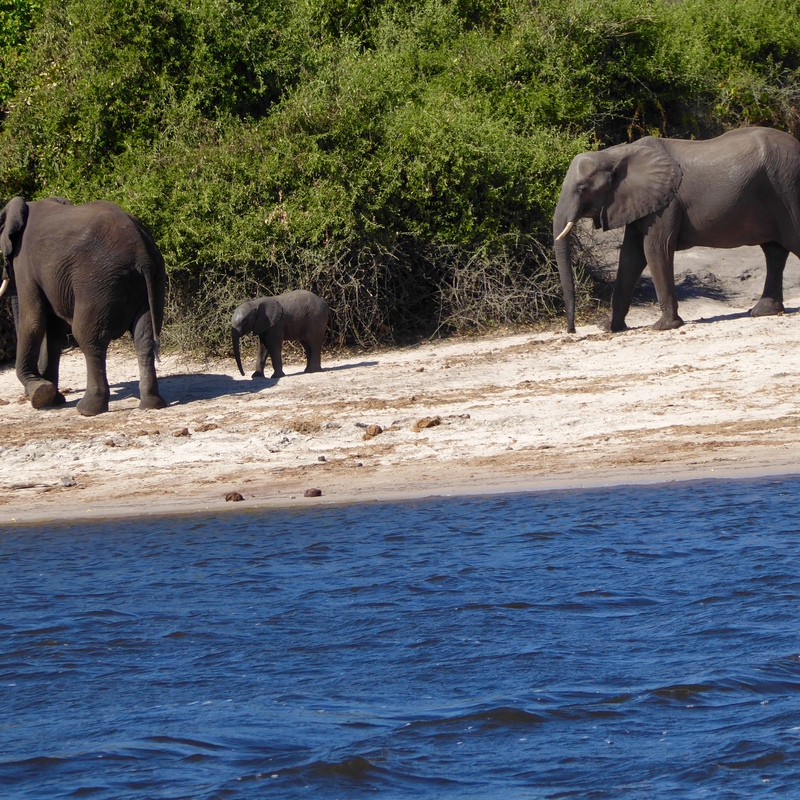 This was my first time in Africa, so my first safaris, but mom has been here a couple times and experienced safaris in Kenya, Tanzania and Uganda. We both loved these safaris. I have to tell you something amazing. The other humans on our game drive were from Colorado and one couples lives less than 10 miles from our home in Colorado. 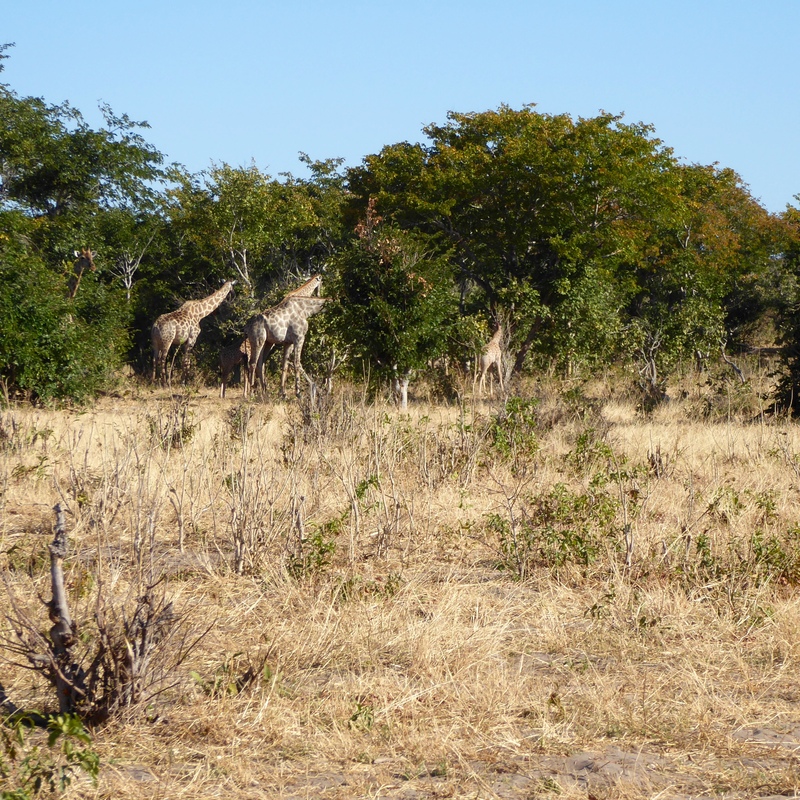 And we met on a safari in Botswana! Mom and I are now in the car, entering Zimbabwe. The other humans are staying in Zambia, so we are in separate cars. 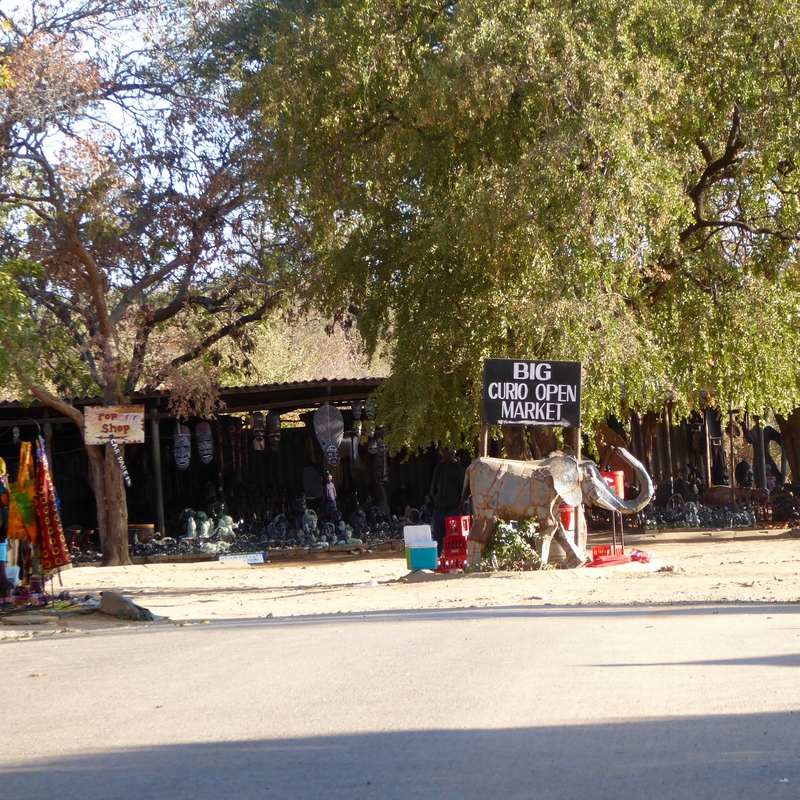 Remember that the road from Botswana into Zimbabwe and then to Victoria Falls goes through a National Park. 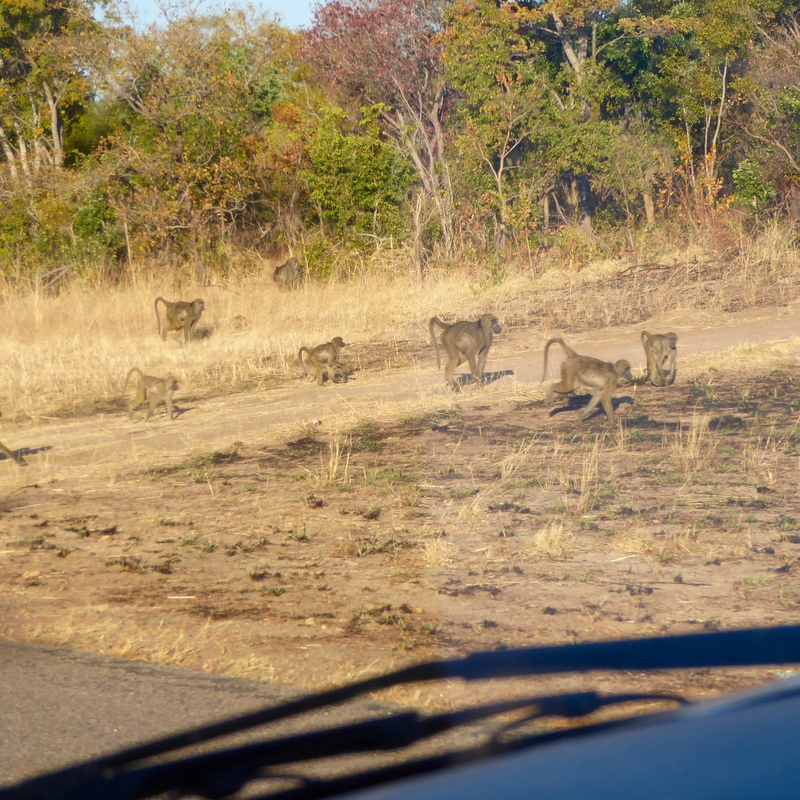 These baboons are really wild and ran away. 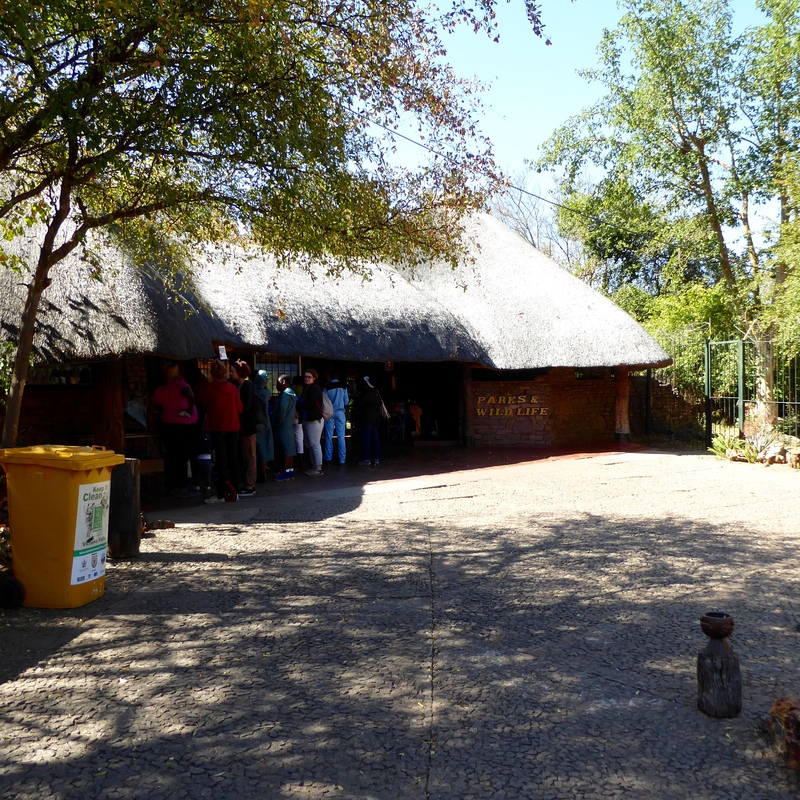 Another day I will tell you about our encounter with another baboon; one that was not afraid of humans. 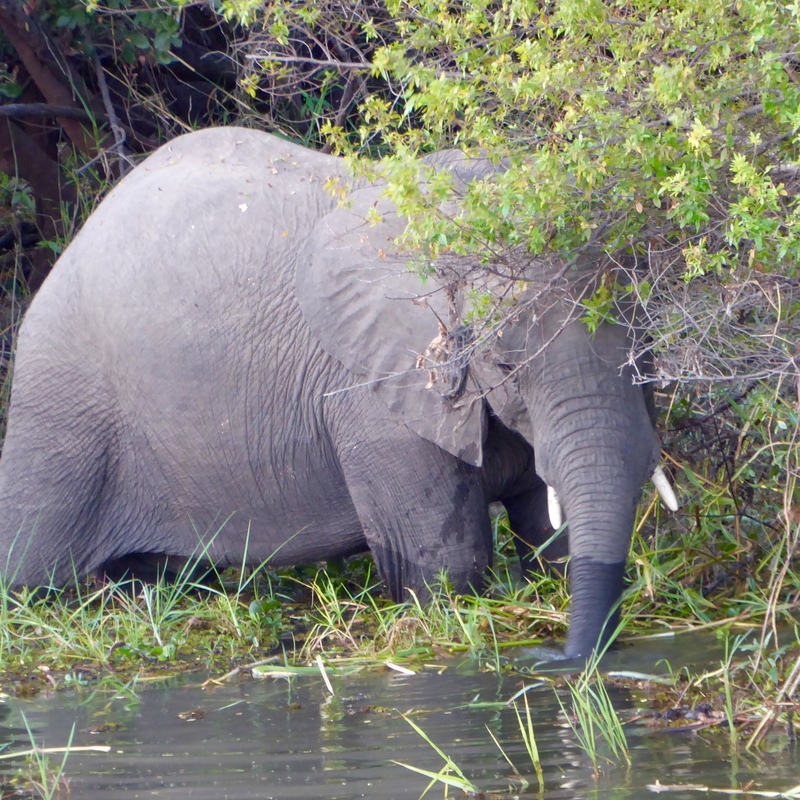 We are back in Victoria Falls, Zimbabwe and it is dinner time. The gentleman in our hotel office recommended a restaurant. 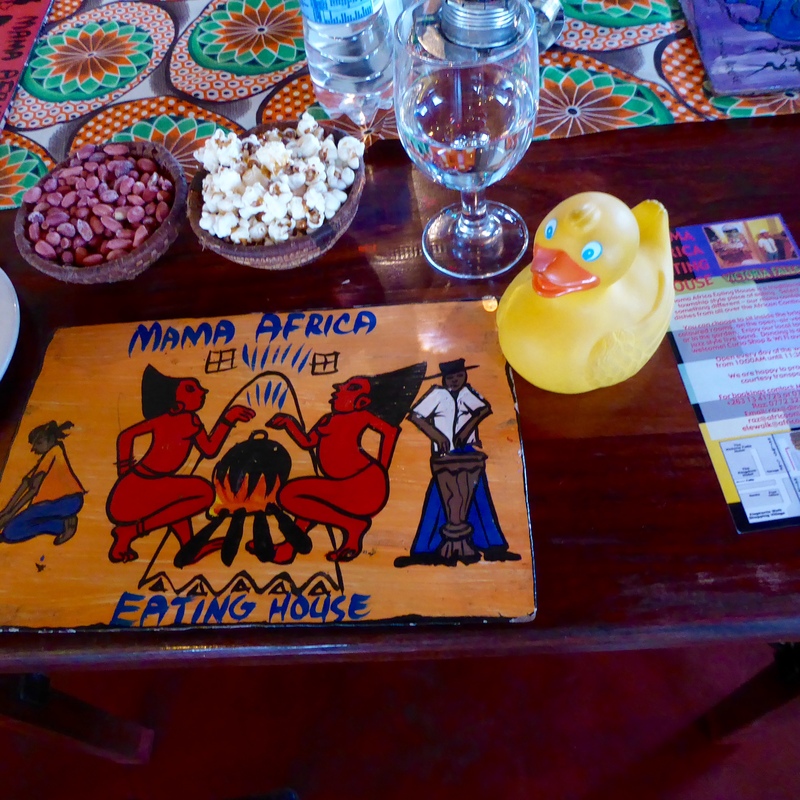 Here we are at Mama Africa Eating House. At our table we loved the colorful placemats. The peanuts and popcorn were delicious for snacking while our food was being prepared. 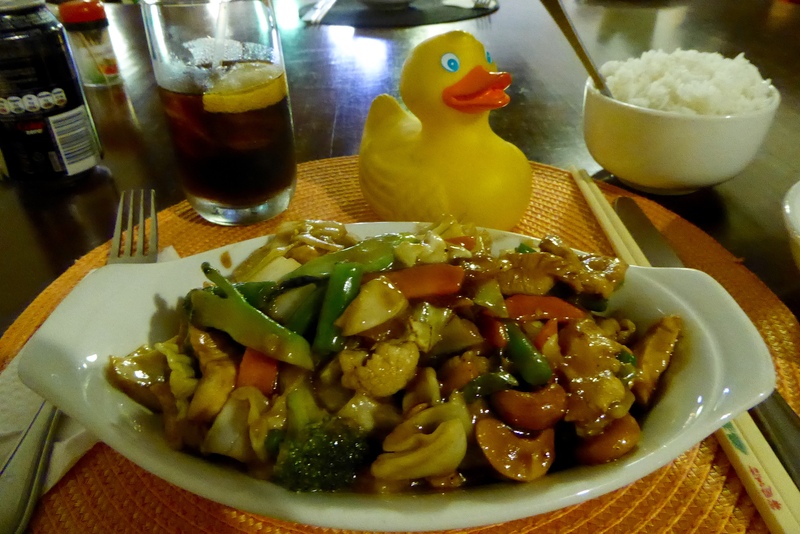 We ordered Nuku Nedovil. That is a Shona dish of chicken and peanut butter with rice. Yum! I love chicken and I love peanut butter. 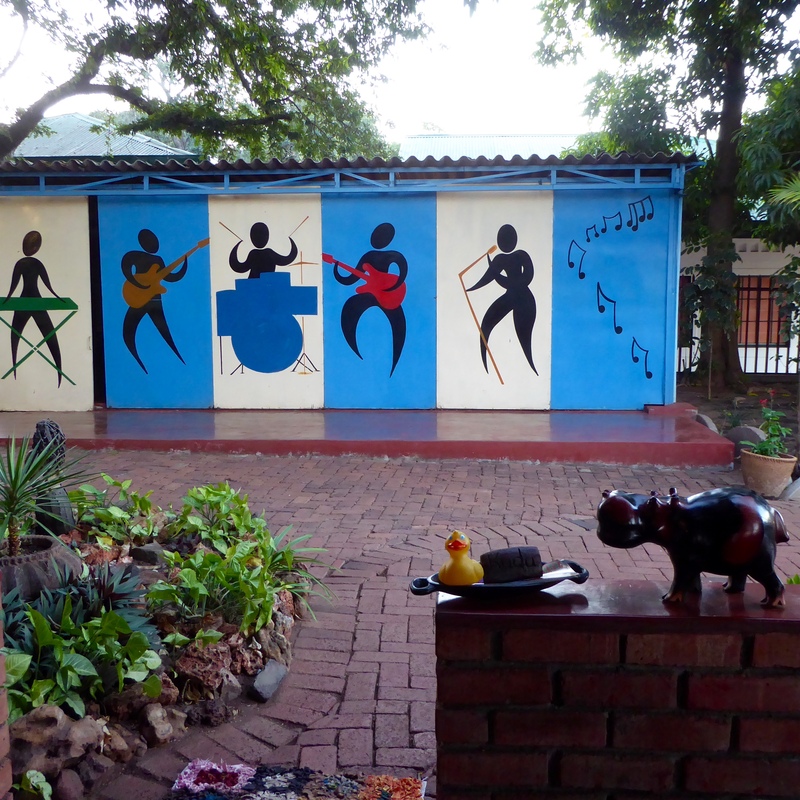 When we arrived we admired the paintings on what we thought was a storage area. 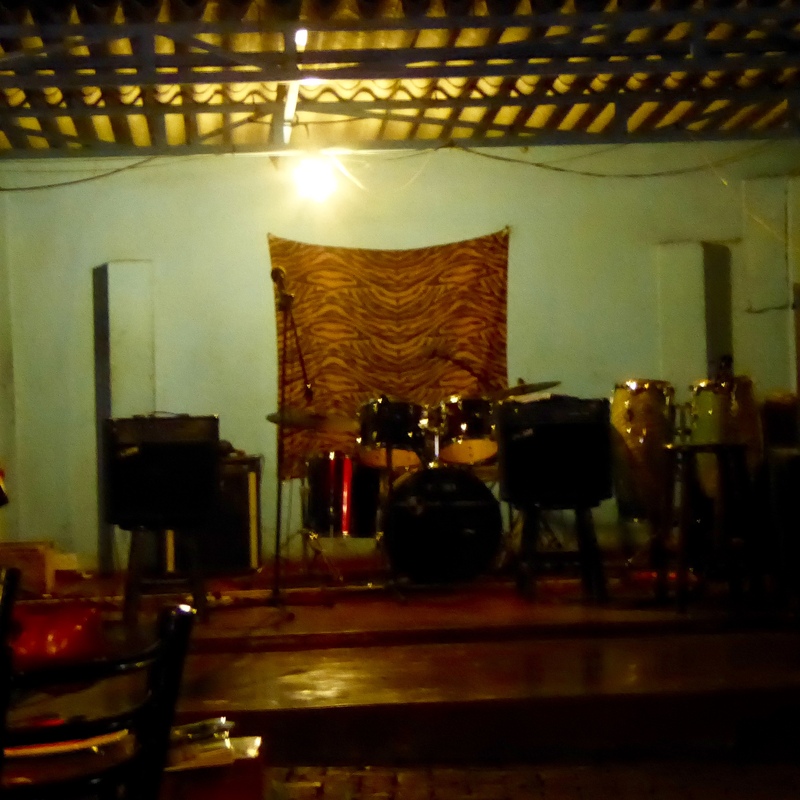 We soon learned that the doors come off and this is the area for the band. Live music is great during and after dinner. The food was delicious and the people were so nice. 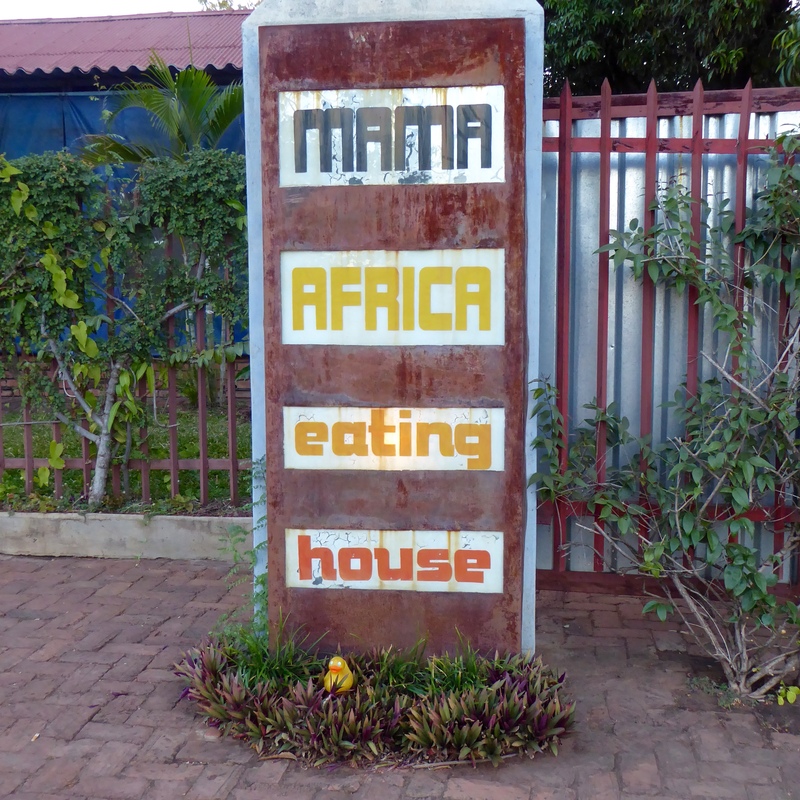 I really liked Mama Africa. When we returned to our hotel we certainly thanked the gentleman for his wonderful recommendation. 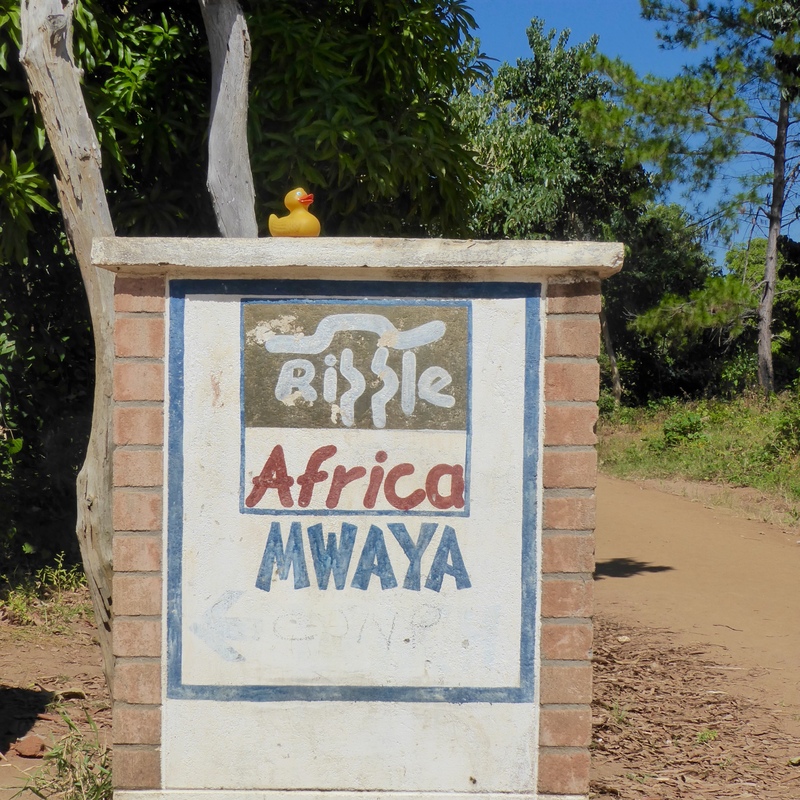 I, Zeb the Duck, am going on a safari in Botswana. 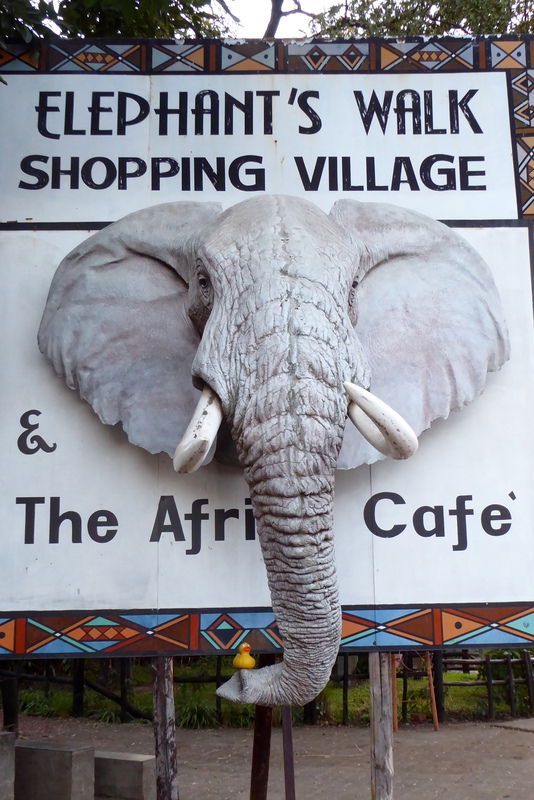 This is a one day trip from Victoria Falls, so we will be back with more about Victoria Falls in a few days. 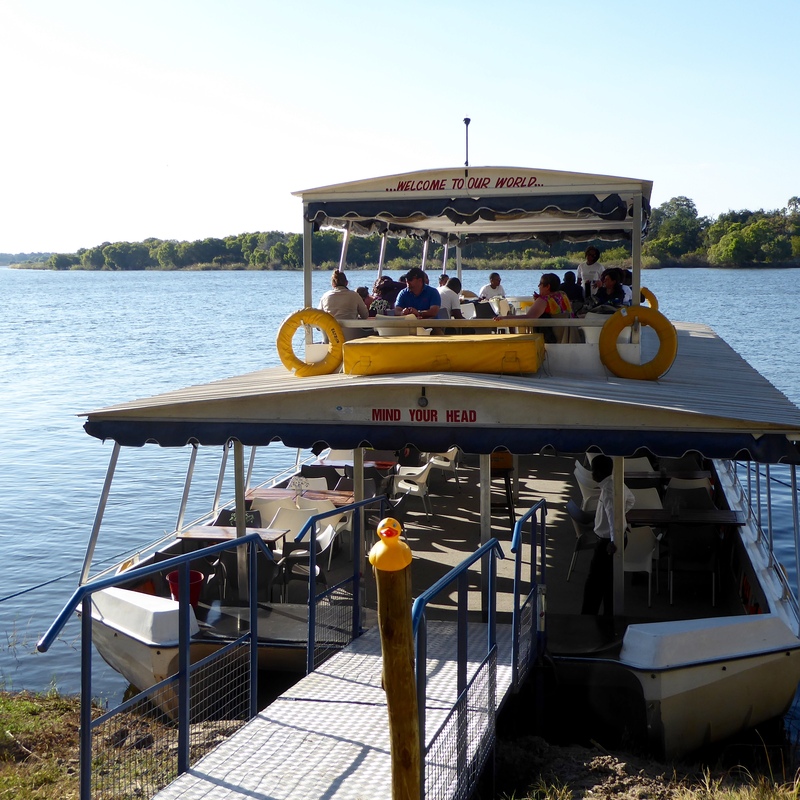 We are going to Chobe National Park and first we will cruise on the Chobe River. 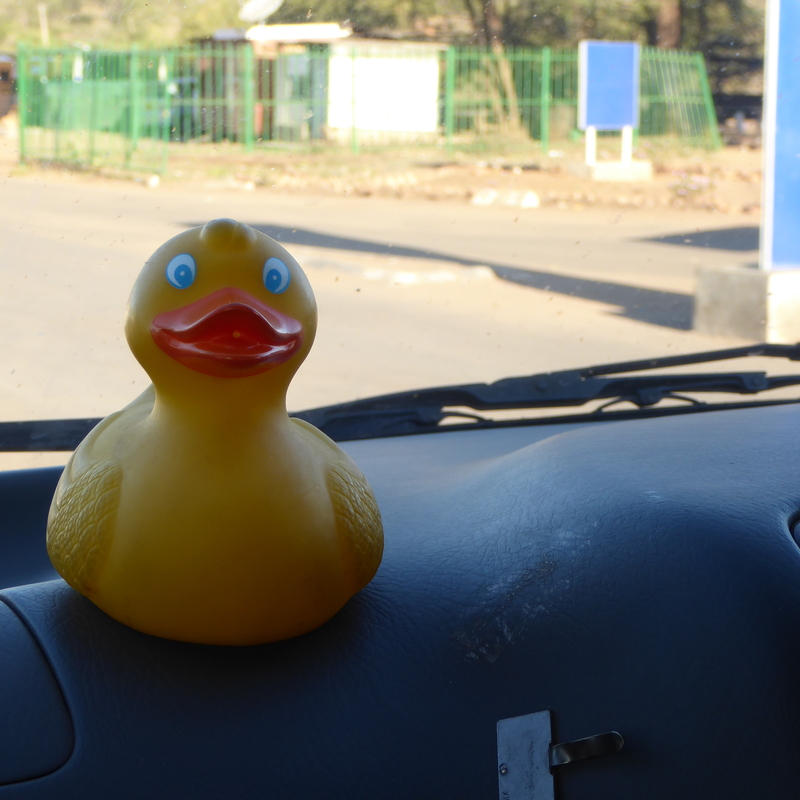 George picks us up early in the morning and we drive about 70 kilometers to the Botswana border. We get passports stamped because we are leaving Zimbabwe; go to the Botswana immigration station, get passports stamped to enter Botswana. Driving into Botswana, we drive slowly through water in the road. This is to wash our ties. We get out of the vehicle and walk through water to wash our shoes. 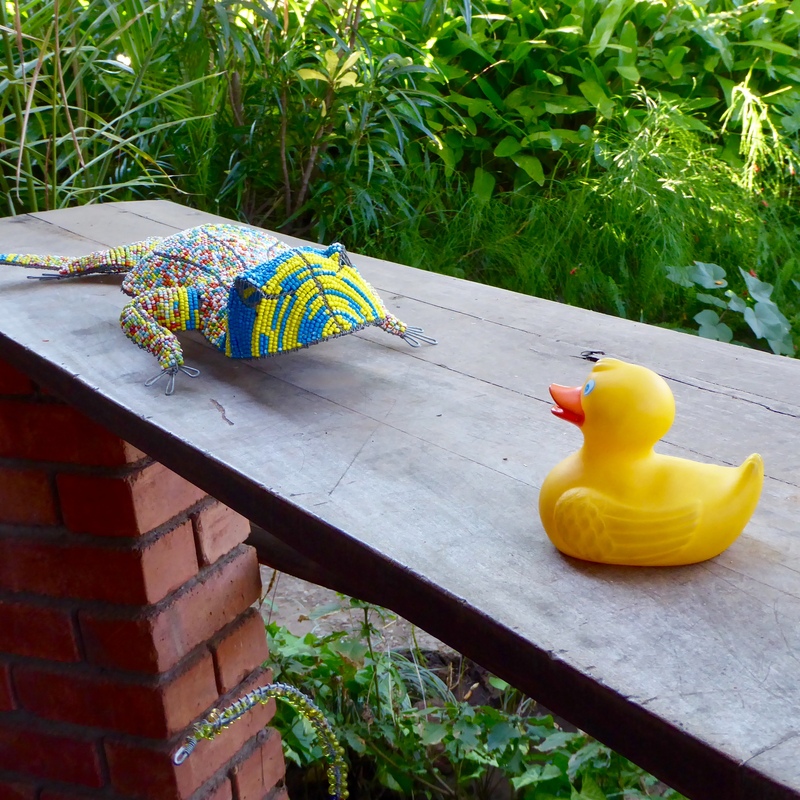 Then Leonardo meets us and we go to Chobe Safari Lodge. The lodge is beautiful. 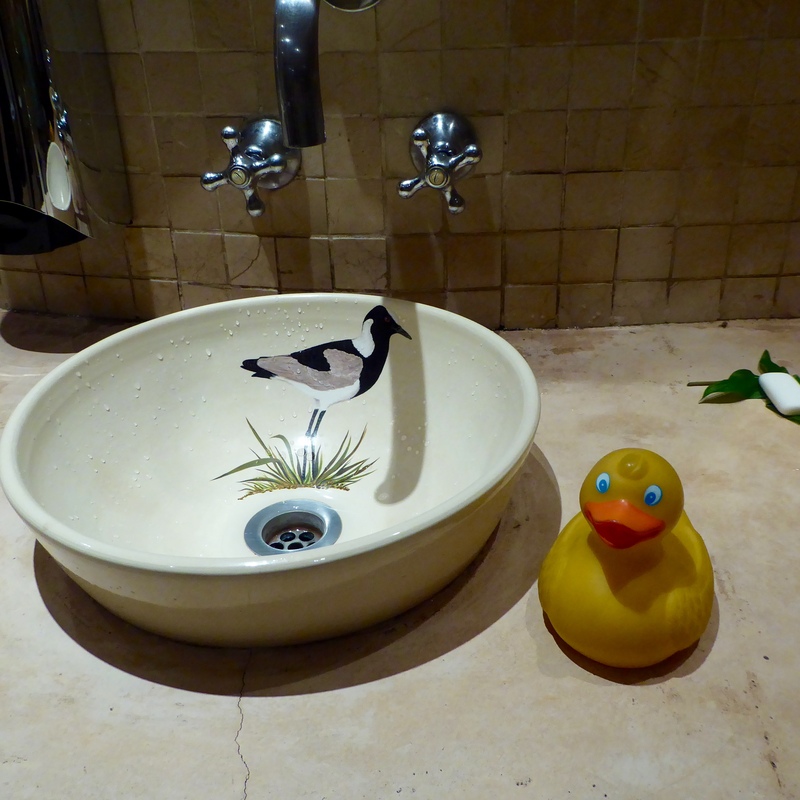 I was so happy to wash my feathers here. Look at the birds in the sinks. I love this place! Of course, we love the pool. We will return here for a lunch buffet. Yum! I am on the boat and ready to go. There are some very nice ladies from Sydney, Australia on our boat safari also. This colorful bird must be our mascot. 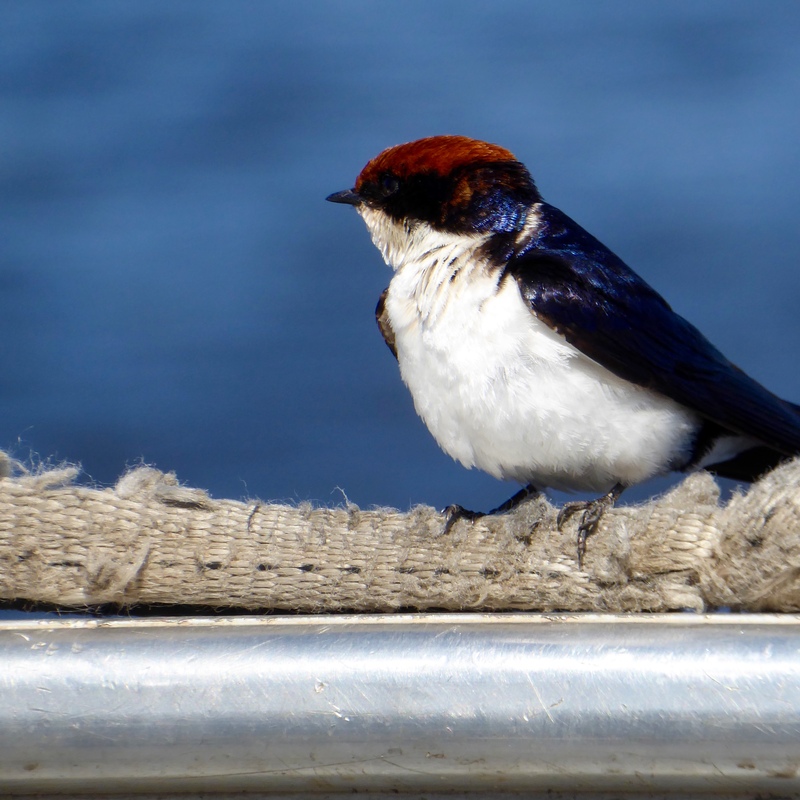 He stays with us, leaves for a few minutes, then returns to our boat. He is small and beautiful. 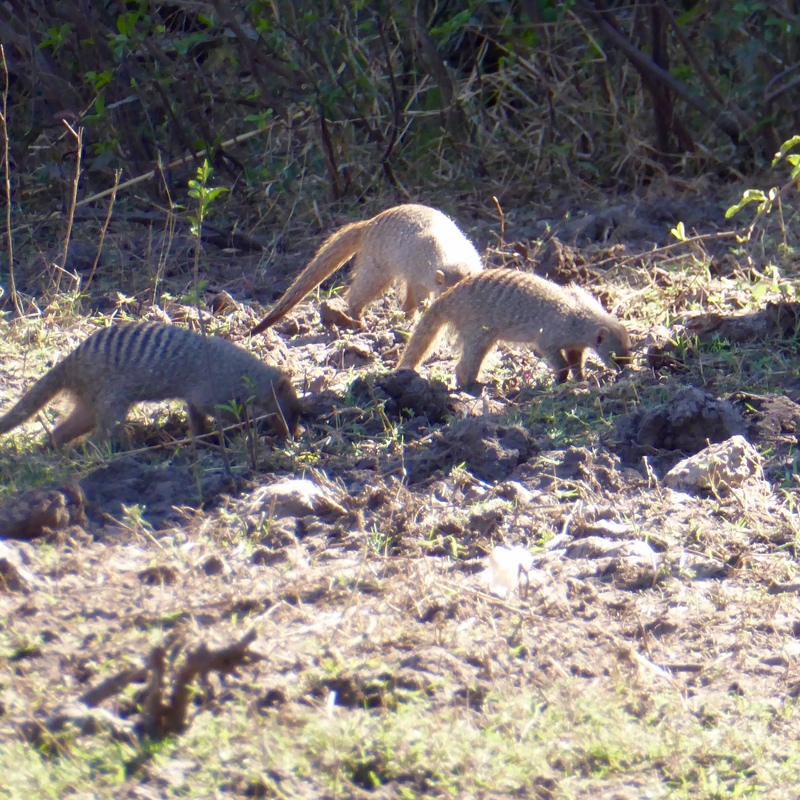 These mongoose seem to like us. 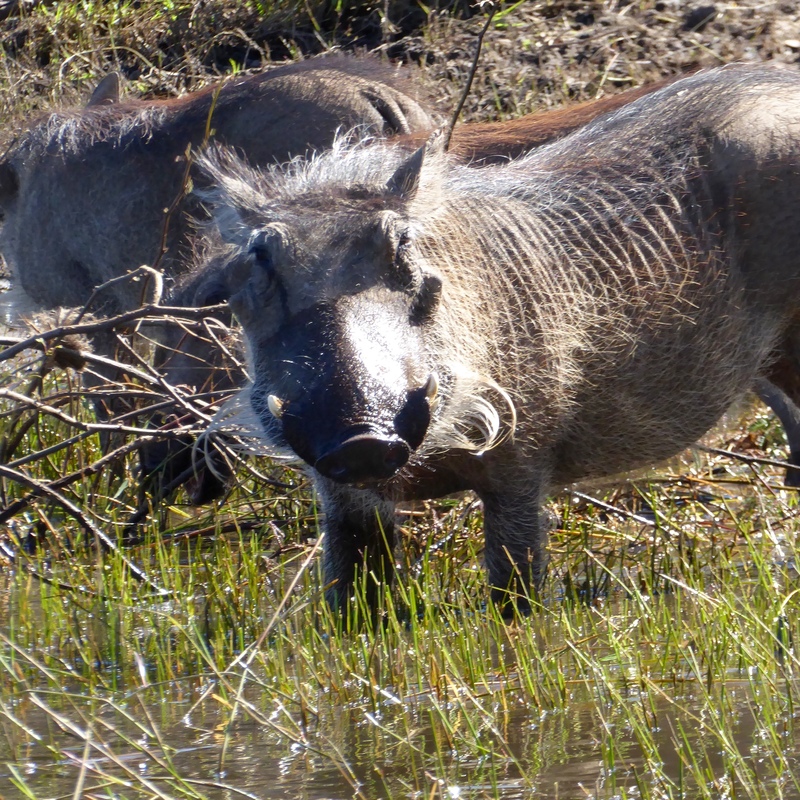 I like warthogs. 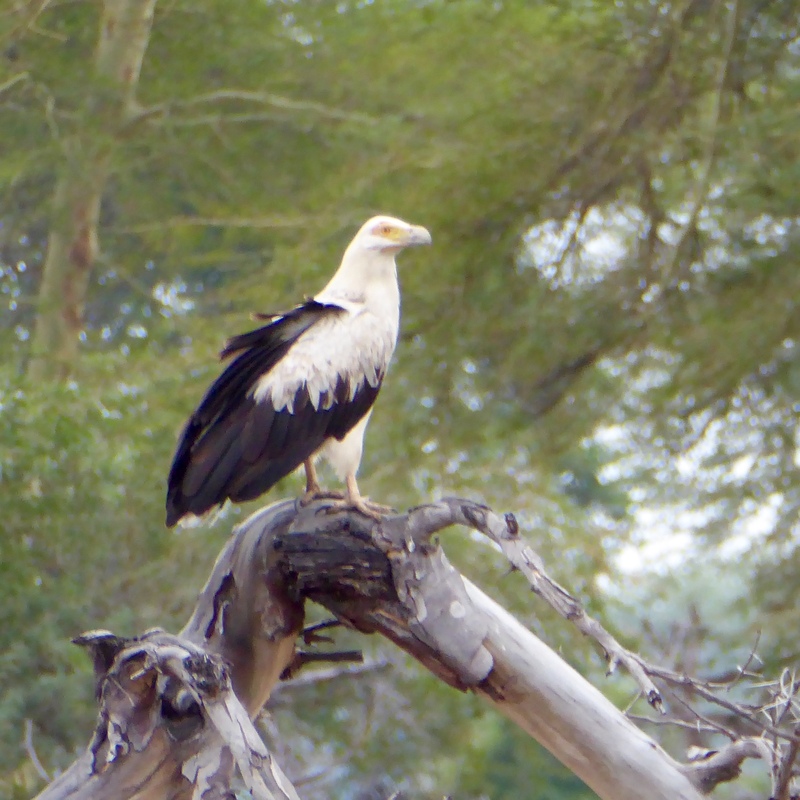 We saw many of them in Liwonde National Park in Malawi also. Isn’t he wonderful? There are many birds here also. 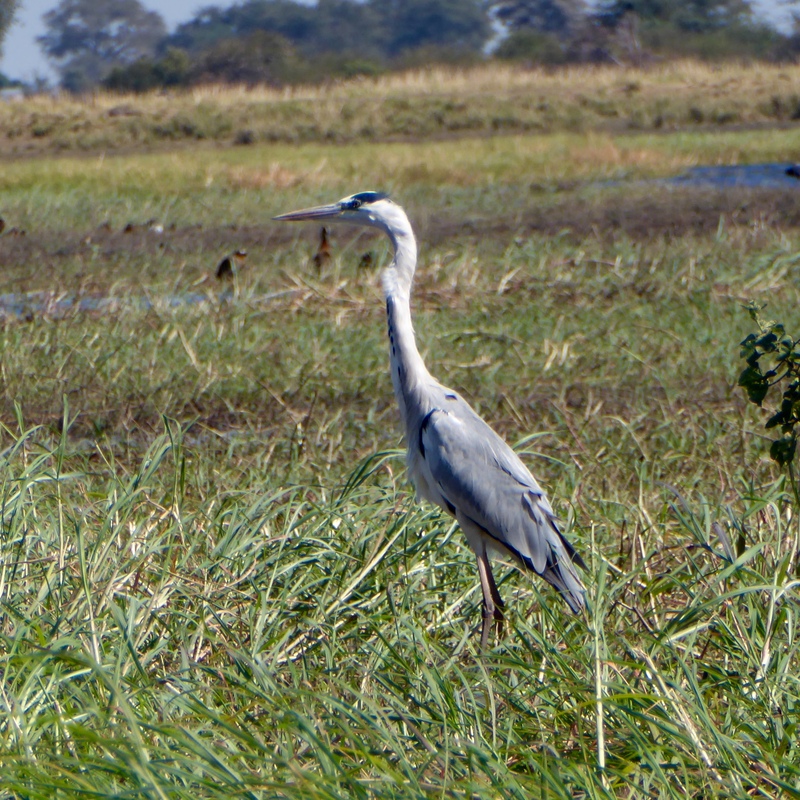 We admire the gray heron. 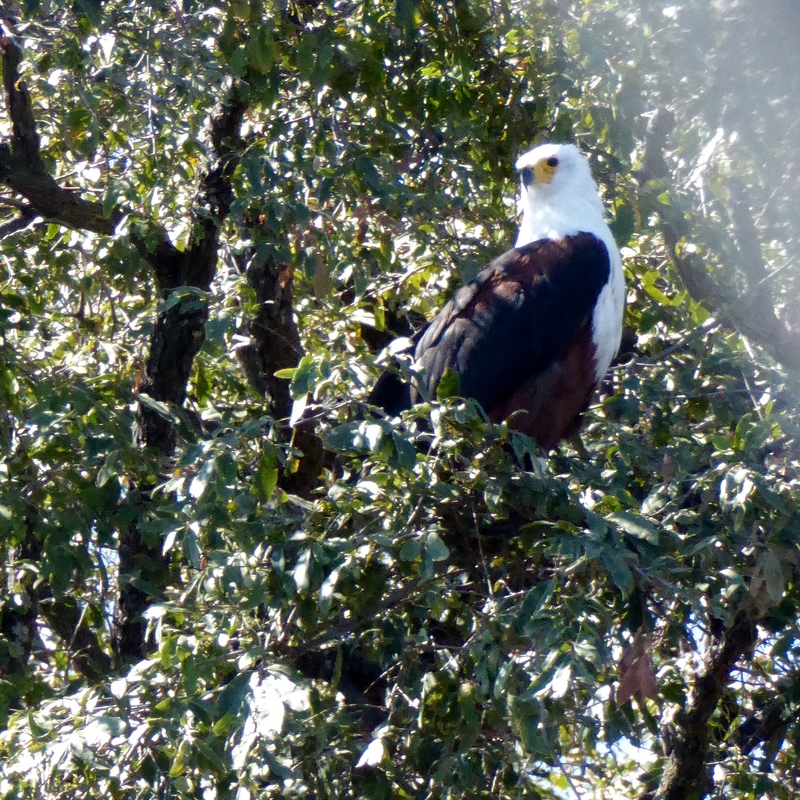 And, we recognize the fish eagles. 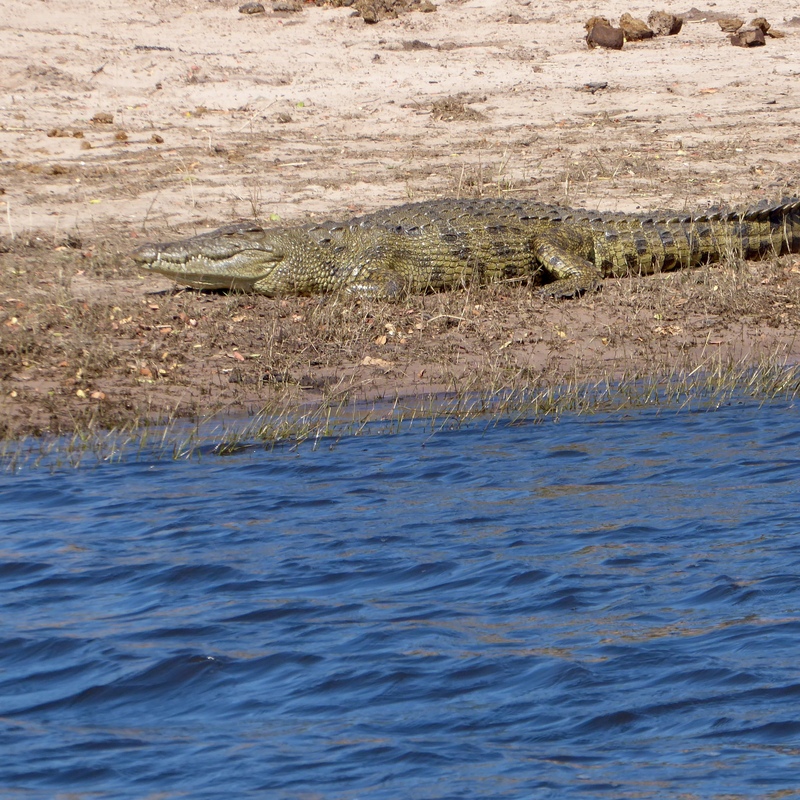 This is a Nile crocodile. He is big and more green than gray. I love his color. 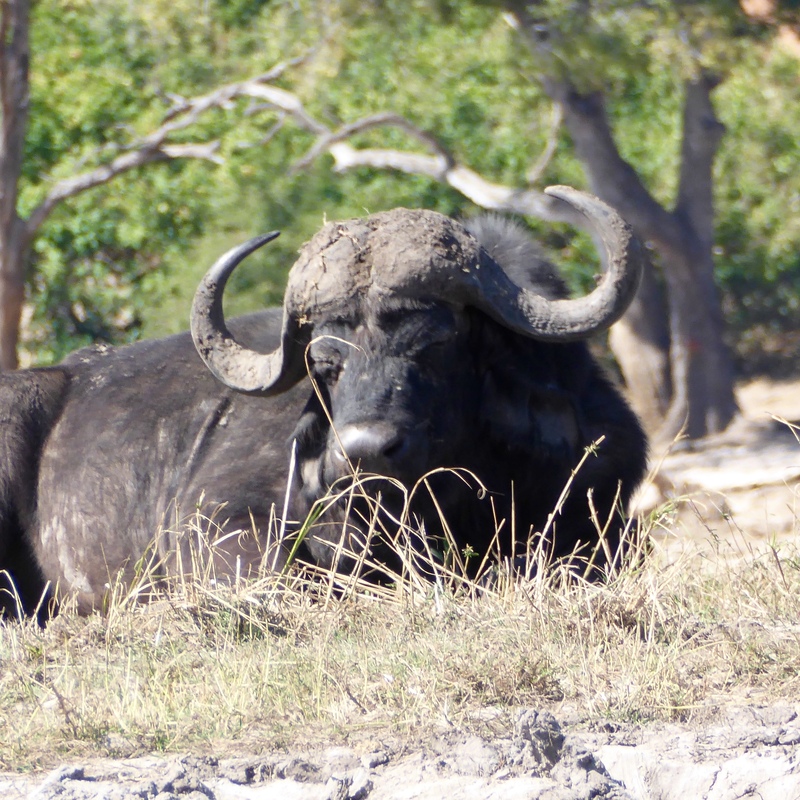 This cape buffalo looks like he combed and parted his hair, but those are his horns. They can be vicious, if they feel threatened. I, Zeb the Duck, would never threaten them. We are visitors in his territory. 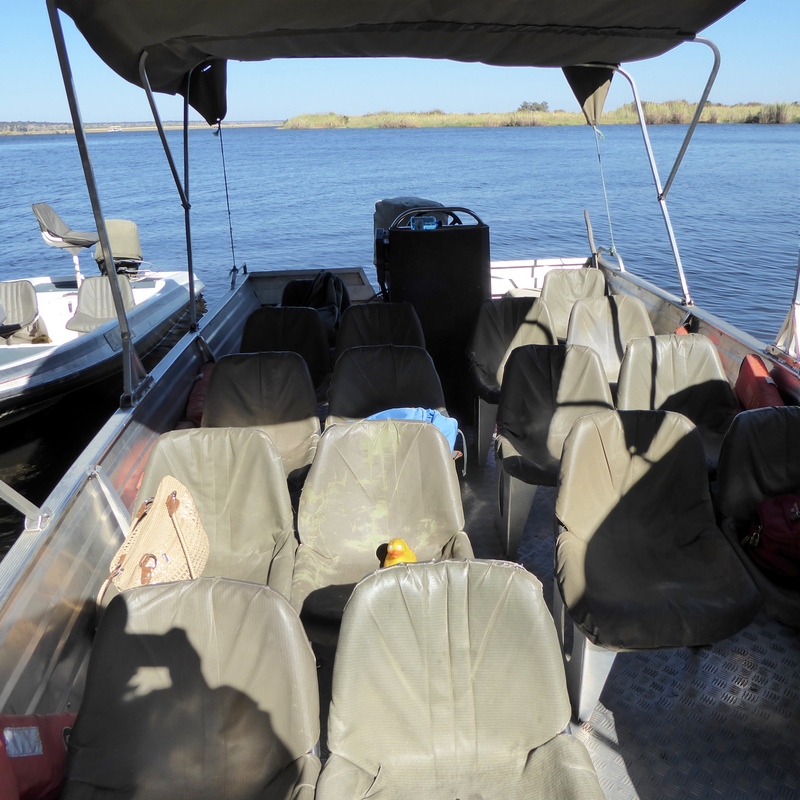 We are on the Chobe River and in this portion of the river, one side is Botswana and the other side is Namibia. This island was claimed by each country. 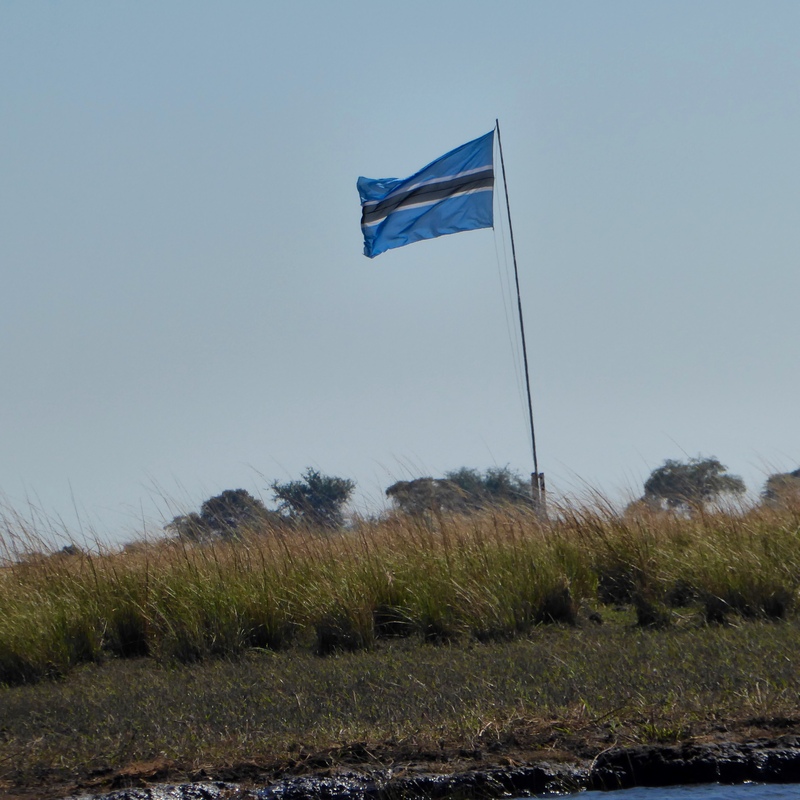 Eventually Botswana got the island and this flag of Botswana, on Sedudu Island shows everyone that this island is Botswana. In Namibia, the island is known as Kasikili Island. Elephants are so big and so magnificent. 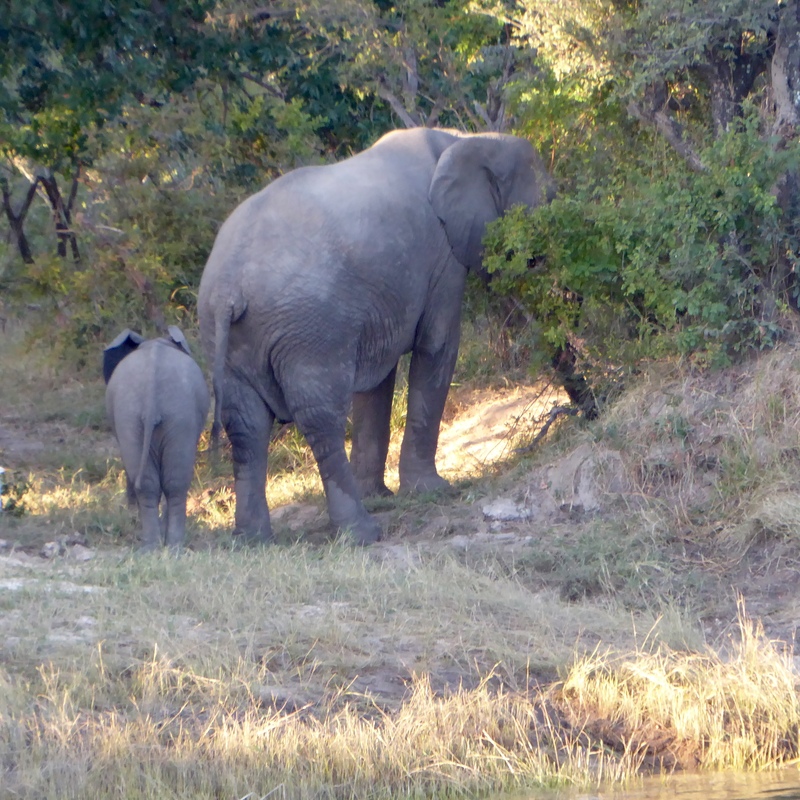 Here are elephants and a small baby elephant. 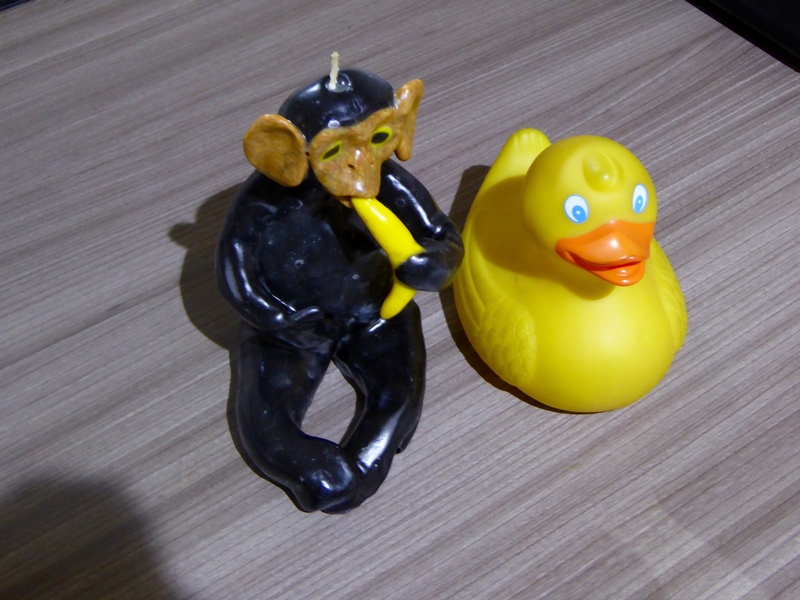 I, Zeb the Duck, and the humans loved these elephants. Don’t you? 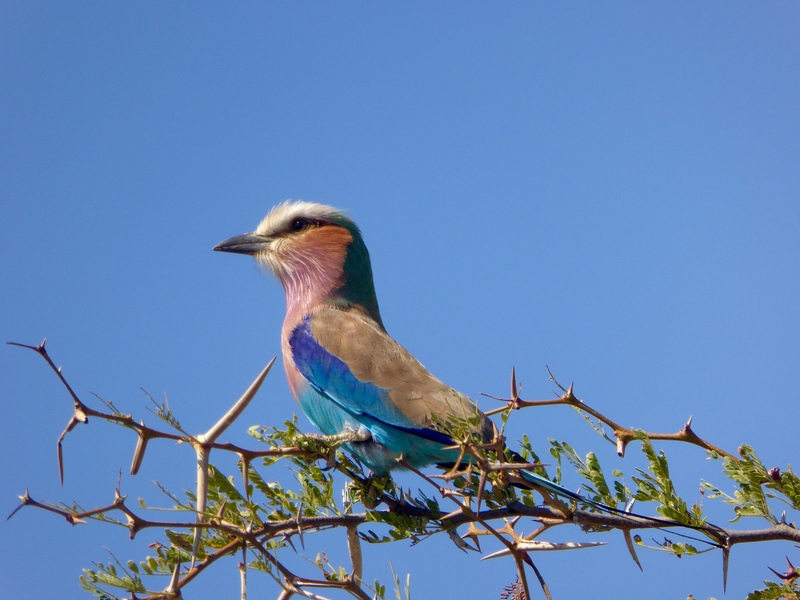 This beautiful bird is the Lilac-Breasted Roller, the unofficial national bird of Botswana. Just as a reminder, I am on this boat, but like before, it is difficult to get me in photos with the animals. I might fall into the river. But here I am, in front of an elephant. I see the elephant and maybe he sees me. 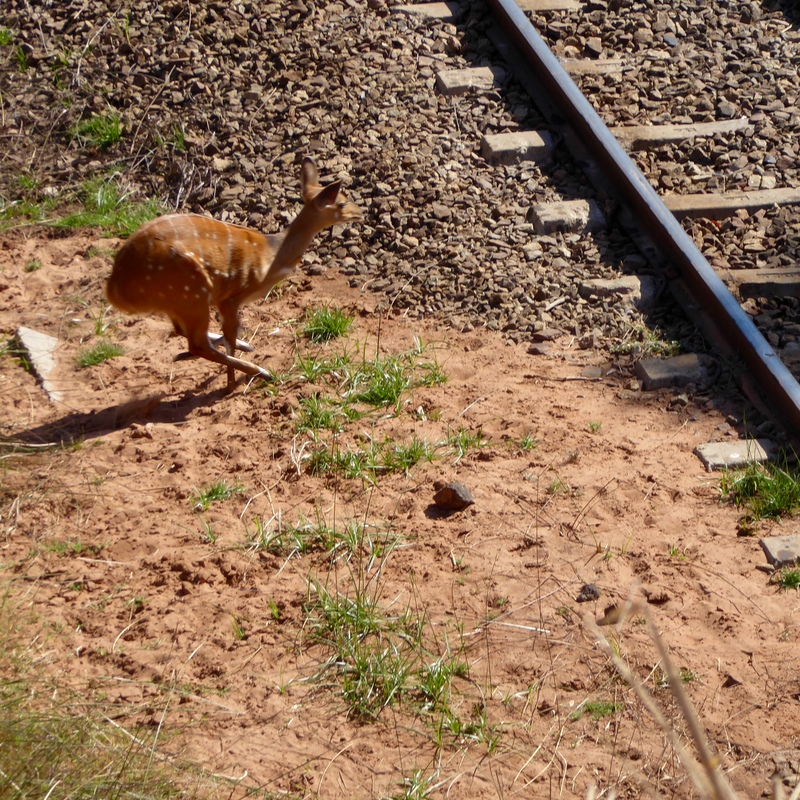 The country of Namibia has a huge desert, but this small part of Namibia has these same animals. This is a safari lodge in Namibia. 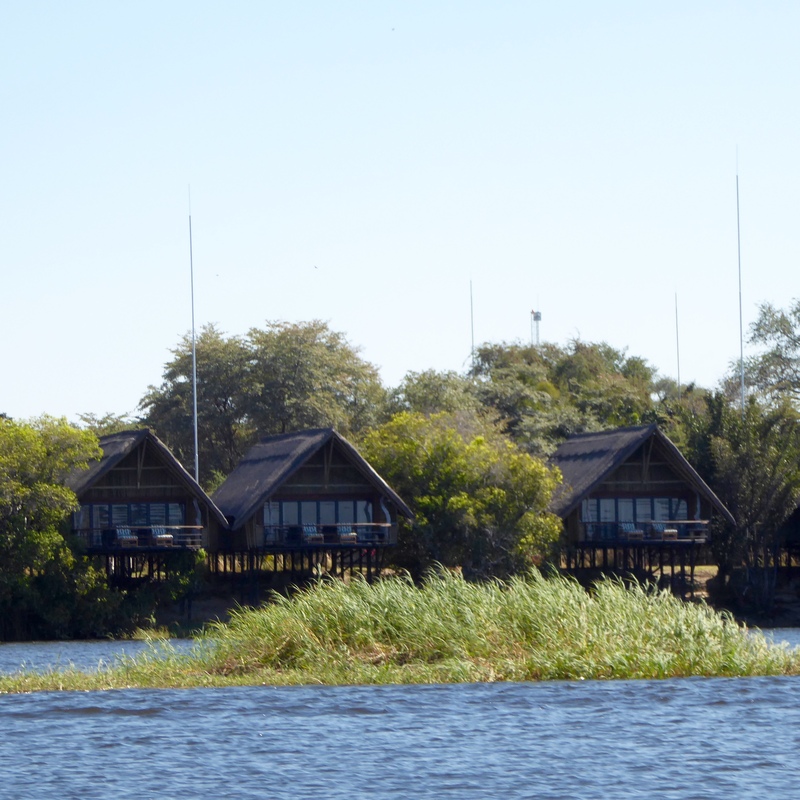 Love the chalets on stilts. Maybe next time…? 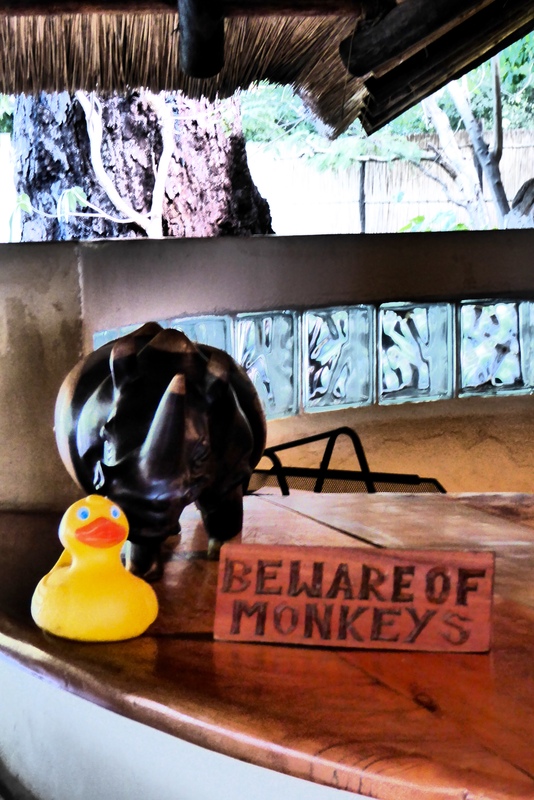 Time to go back to the Chobe Safari Lodge for lunch. 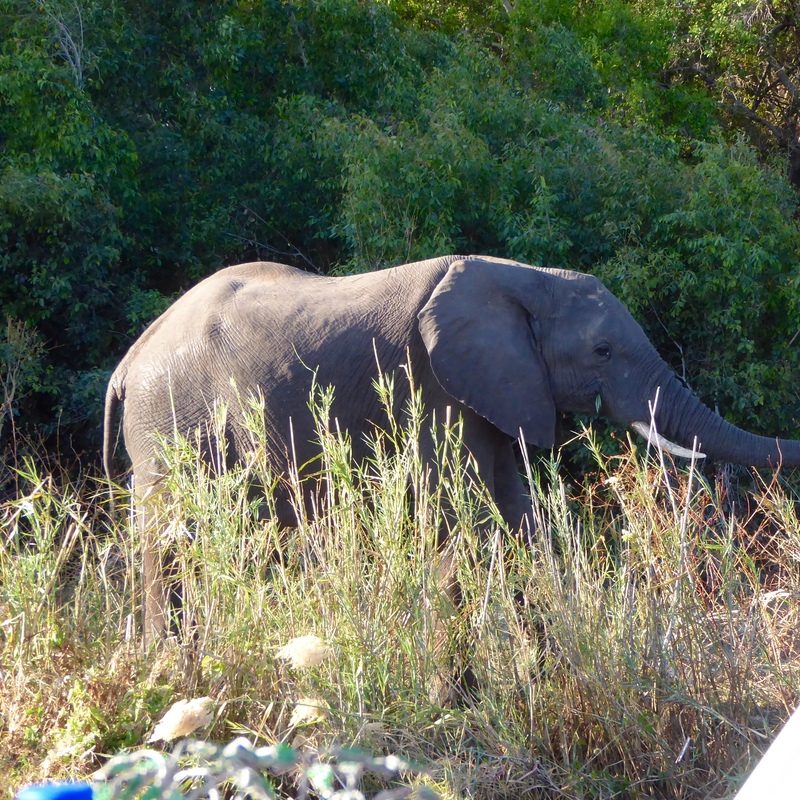 Next time I will show you what I saw on the afternoon game drive. 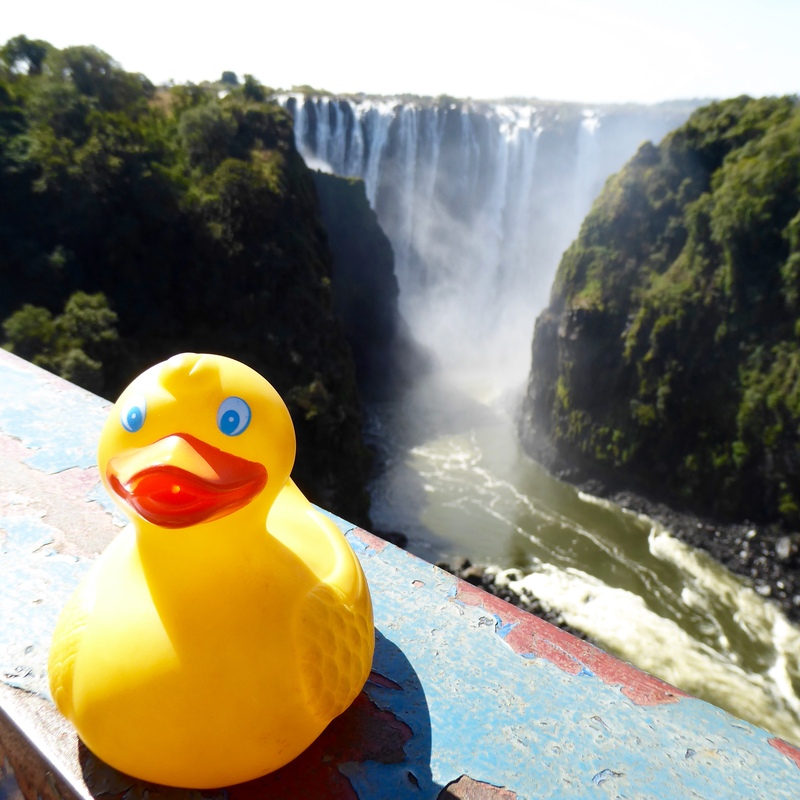 Today, I, Zeb the Duck, will visit Zimbabwe’s Victoria Falls National Park. 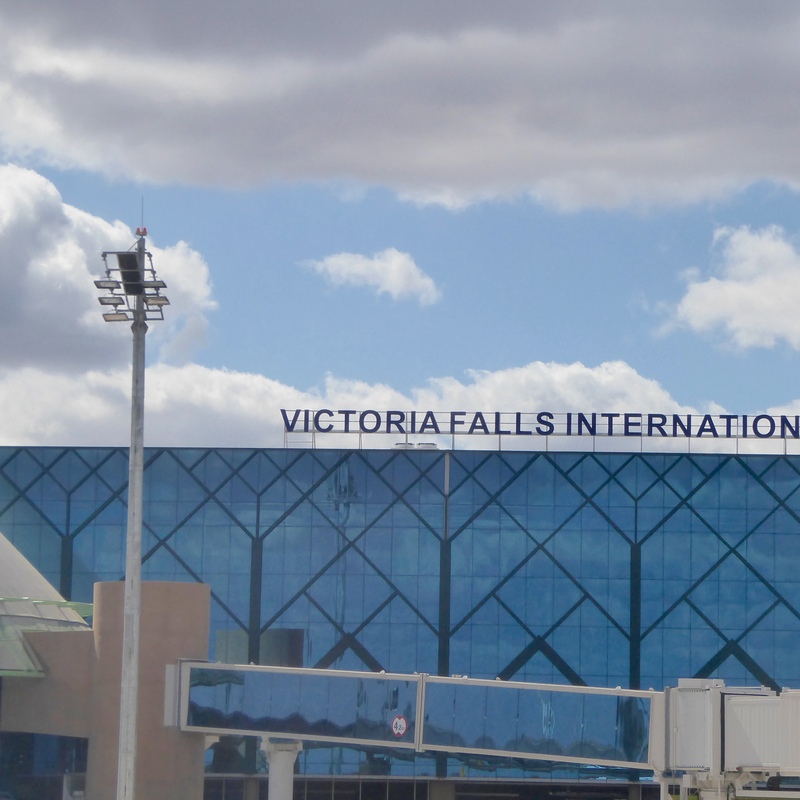 Victoria Falls is considered one of the seven natural wonders of the world, and we can walk to the national park and waterfalls from our hotel. Walking to the falls, we cross a bridge and railroad track. Some men show us the animals under the bridge. Isn’t this great. 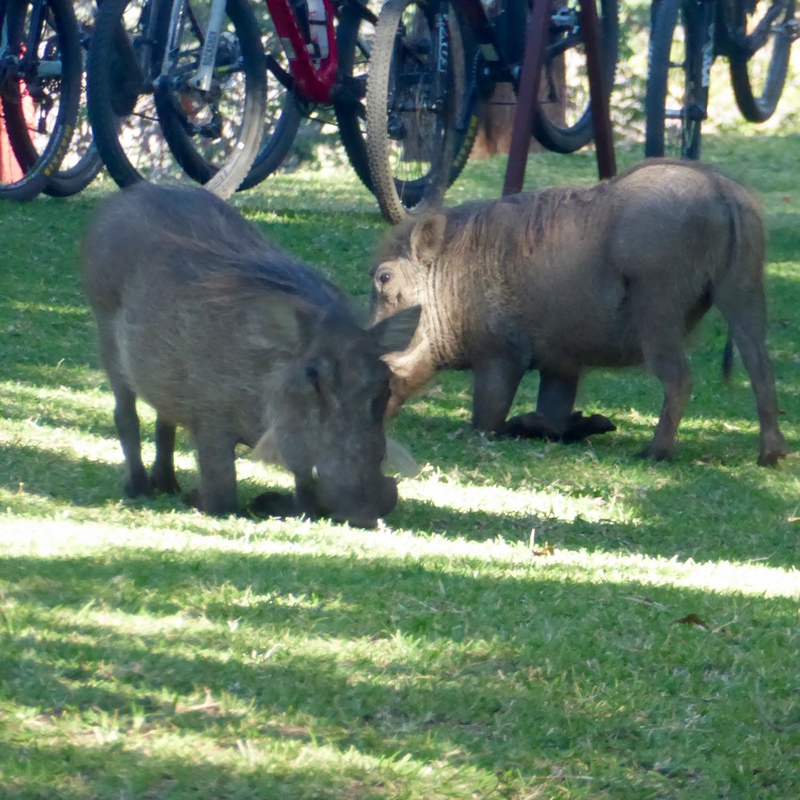 Less that a kilometer from the center of town, and wild animals are here. They said this was a bush bok. The train is coming now. 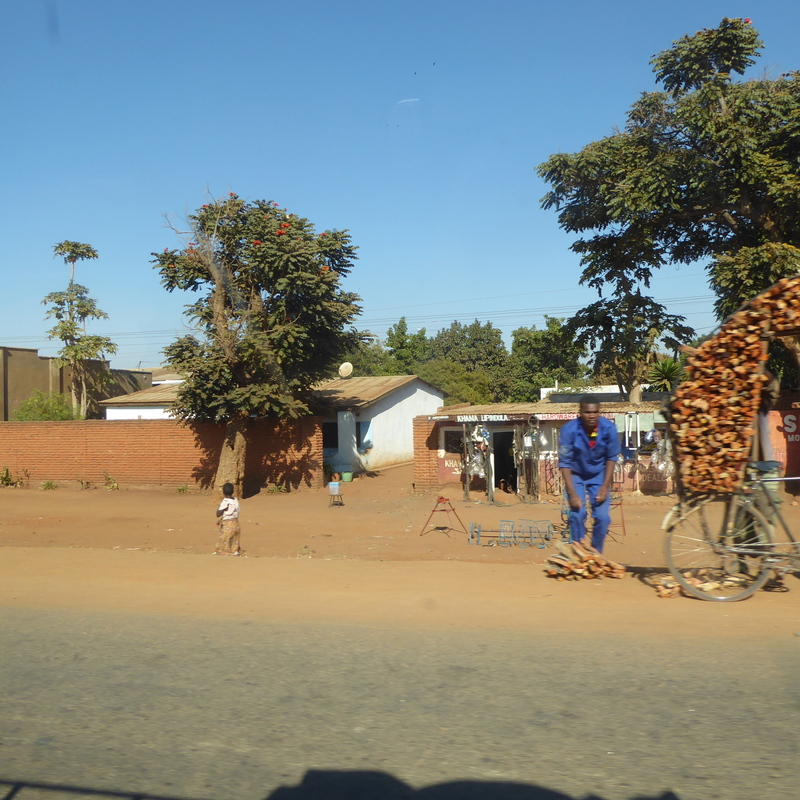 A little further down the road and we see the entrance to Victoria Falls National Park. Victoria Falls National Park, Zimbabwe. That is not our water bottle! We rent a raincoat, pay our park entrance fee and go inside. Let’s buy a ticket and go inside. There is a restaurant and a few gift shops near the entrance. 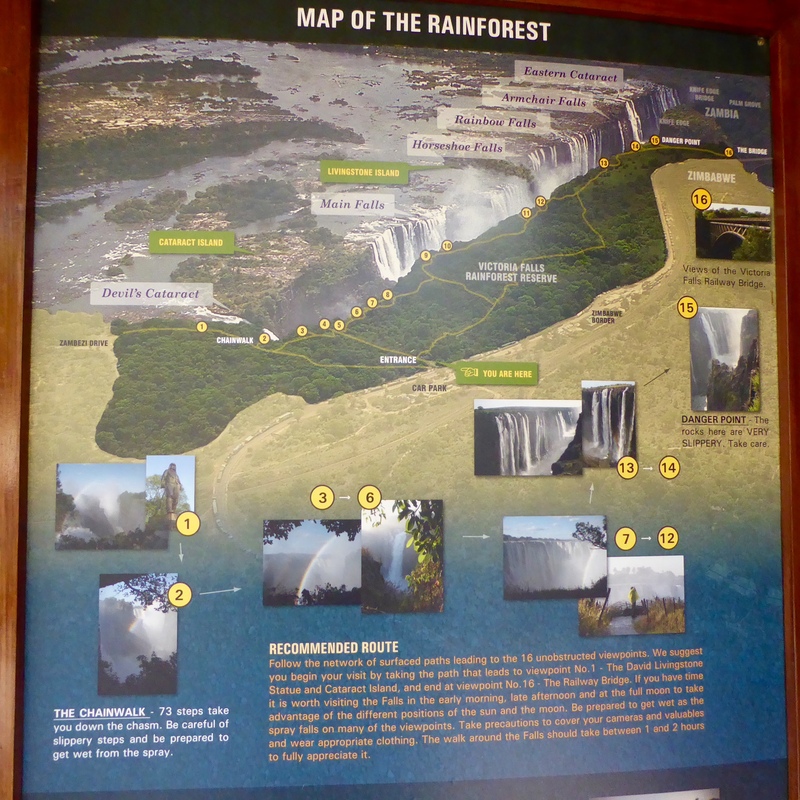 Also several displays with maps and other information about Victoria Falls. We liked this one. Raincoats are recommended because the falls are so powerful that the spray is everywhere. Even with a raincoat, we were soaked, but the raincoat did help, so rent or bring one when you visit. This is one of our early views of Victoria Falls. 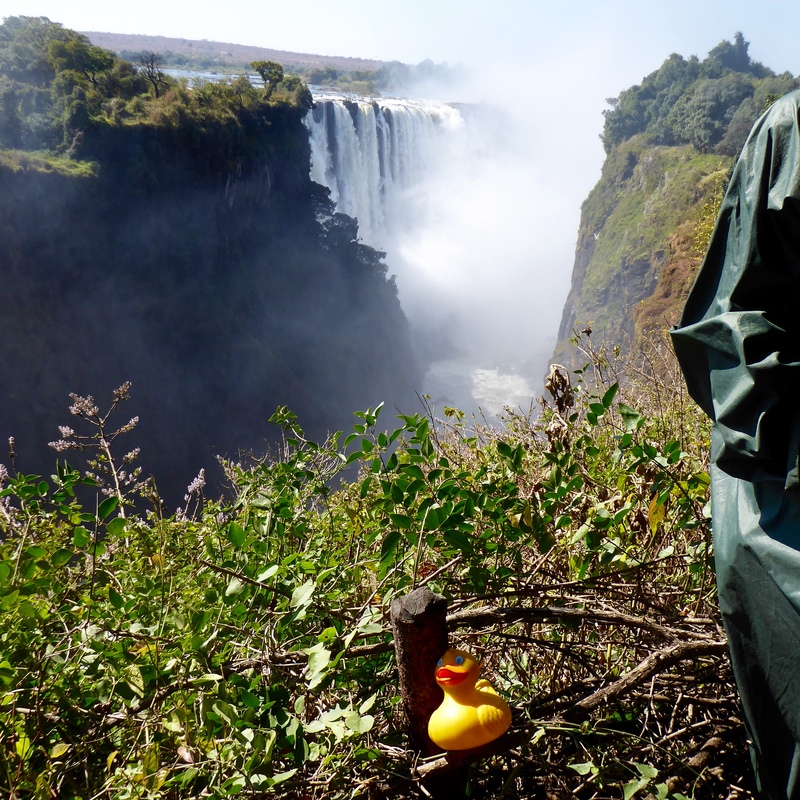 Our first sight of Victoria Falls and green raincoat of a tourist. As we walk further, we see more of the waterfalls. 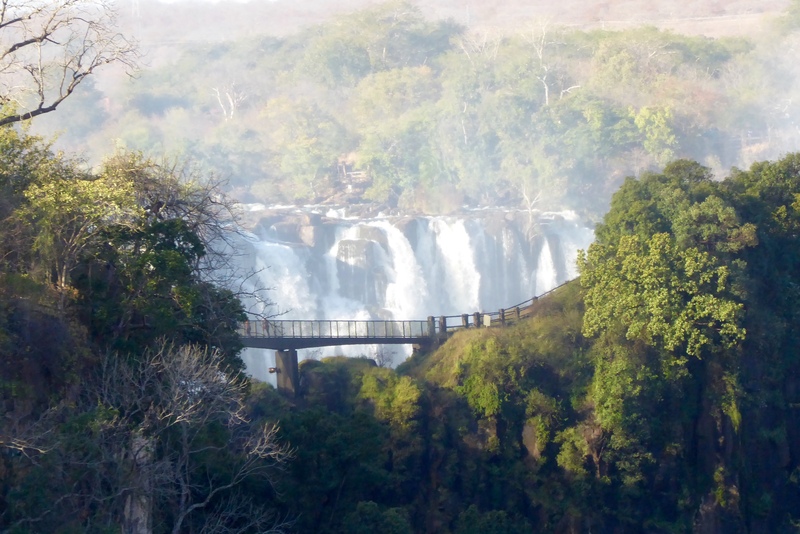 The Zambezi River is about one mile wide at the waterfalls. Walking through the rainforest, we only see sections of the falls at one time. This is still further down the path. 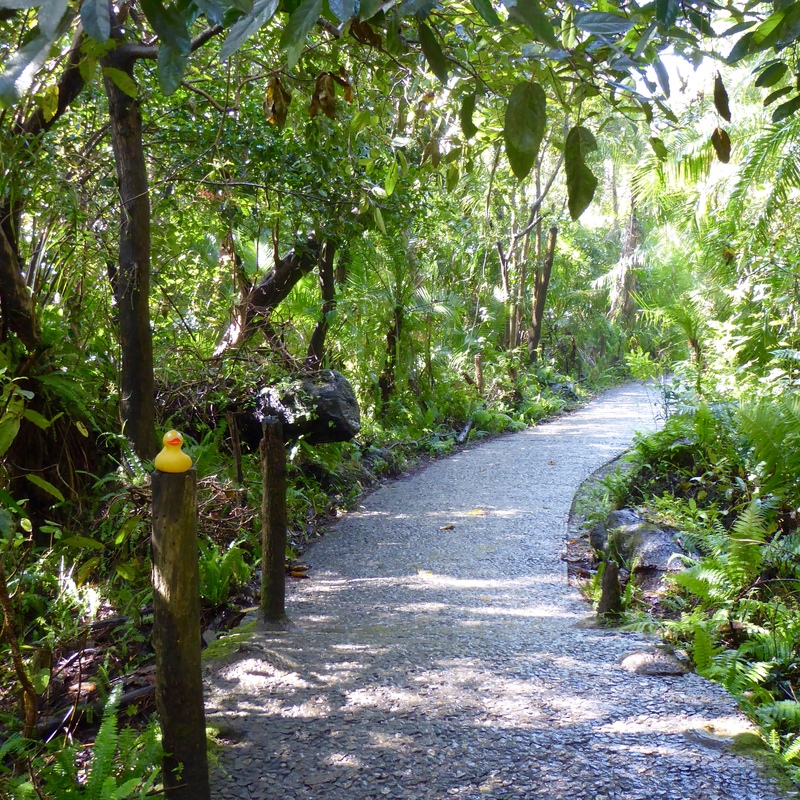 The path through the rain forest is very nice and easy to follow. Path through Victoria Falls National Park near the waterfalls. Much of the time we cannot see the falls, but we can hear the roar and see clouds of mist rising over the river. Victoria Falls was called the “smoke that thunders” by the native people. This is horseshoe falls. Each view of the waterfalls is breathtakingly powerful. On this photo, you can see that we are still rather far from the falling water, but the mist and spray are so powerful, there is water on the camera lens. And we have been cleaning it every few minutes. 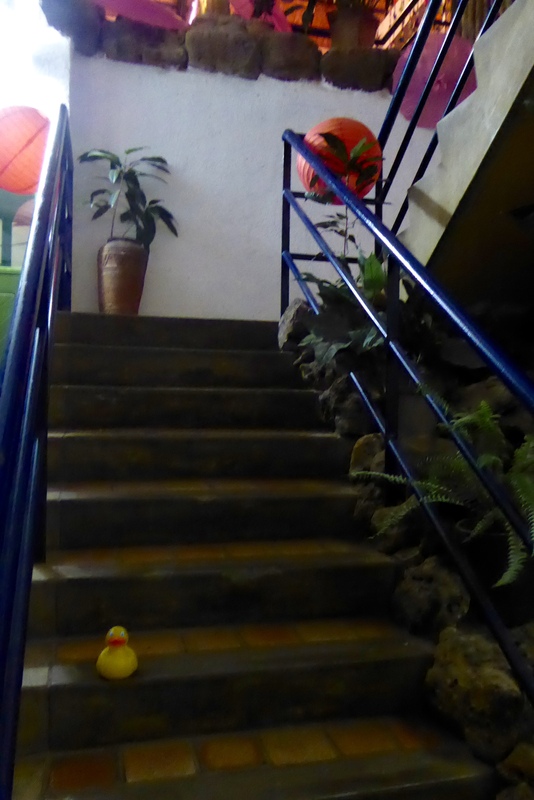 The guidebooks say that this is a place you must see, and I, Zeb the Duck, agree. 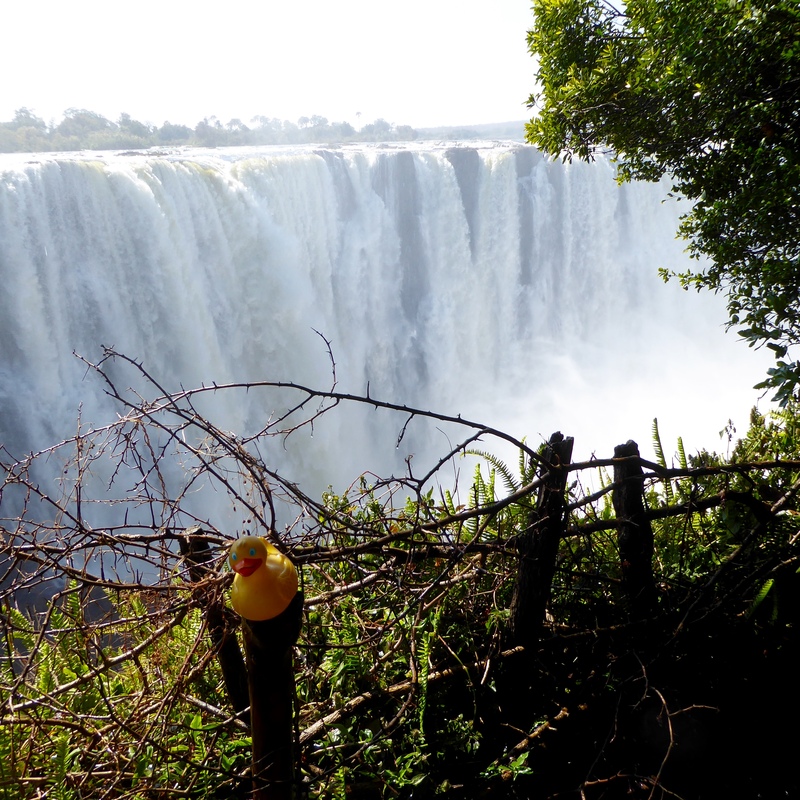 Being there, at Victoria Falls, you can see it, hear it, feel and taste it (the spray is everywhere). 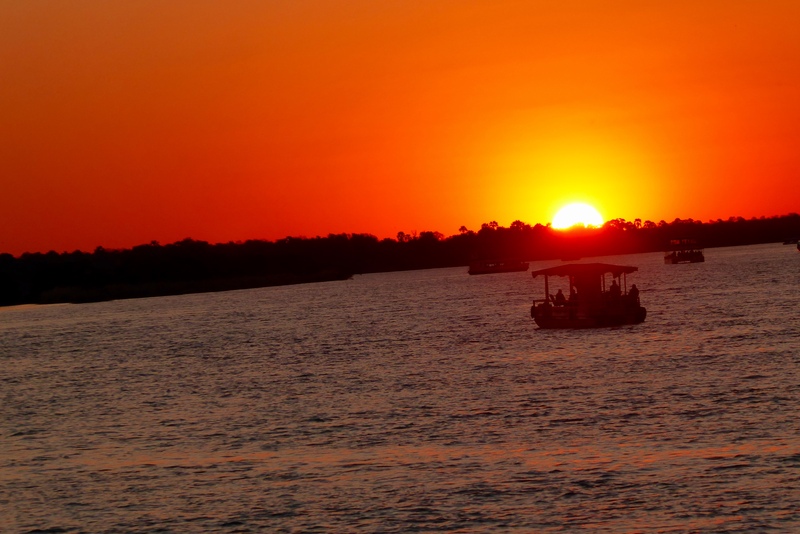 The Zambezi River and Victoria Falls dominate this part of the world. 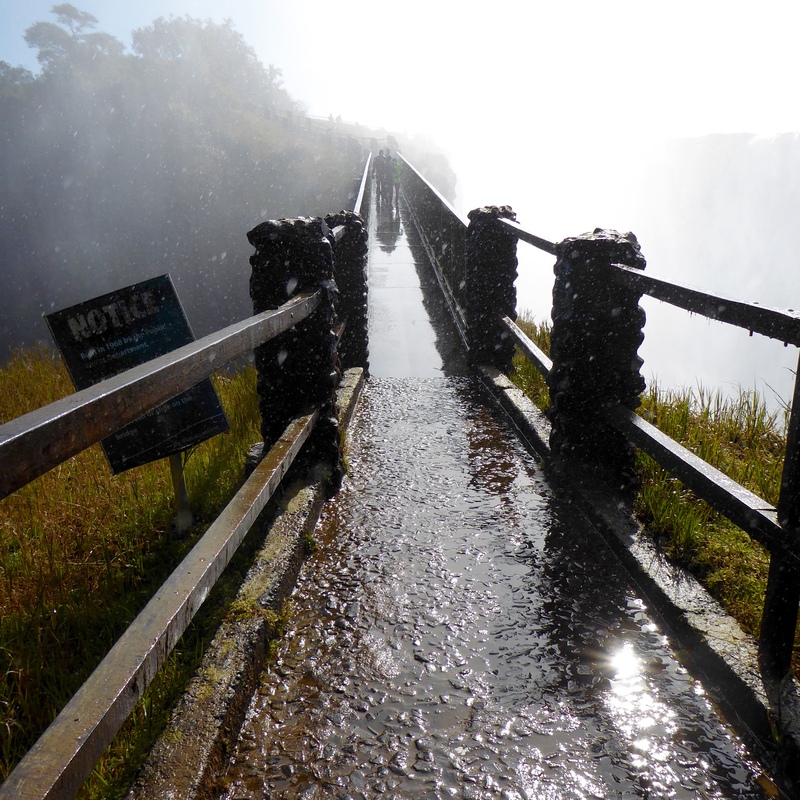 Reaching the end of the path, you will have a great view of Victoria Falls Bridge. 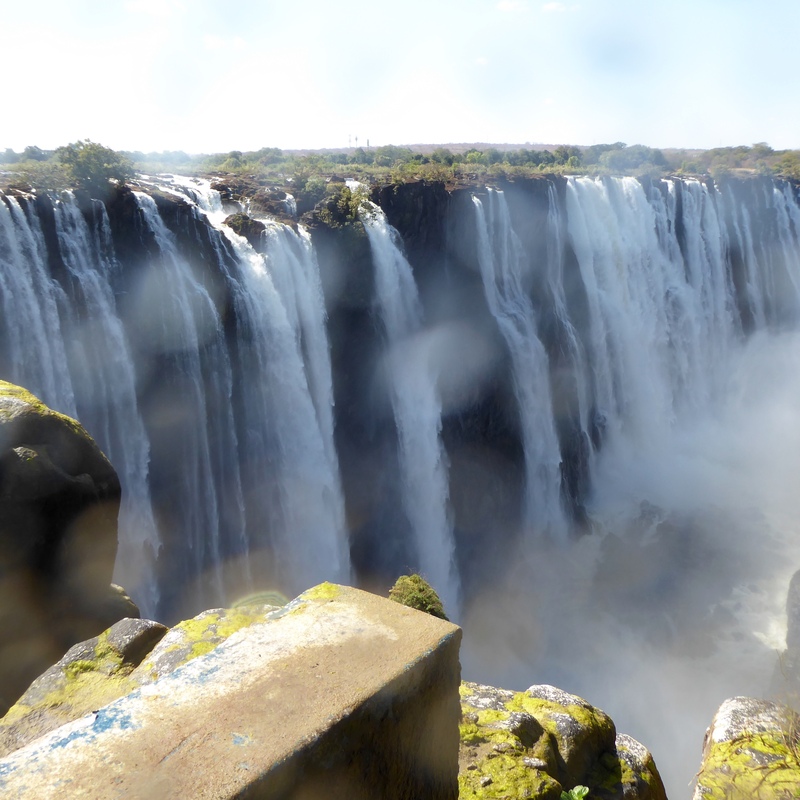 At Victoria Falls, one million liters of water drops every second! That is a lot of water. Those one million liters that fall every second, fall 107 meters, or 351 feet. 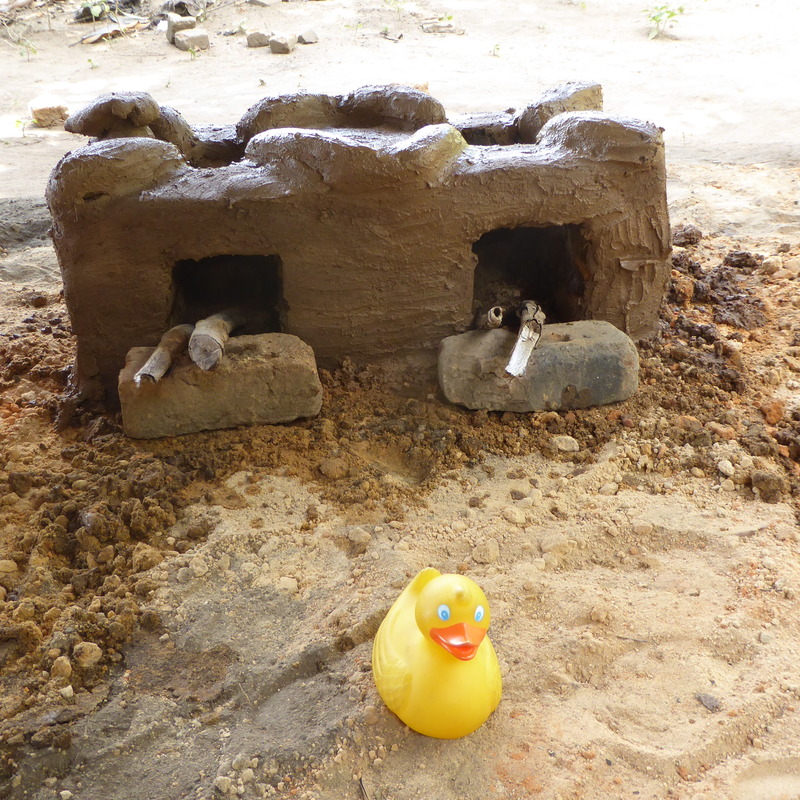 When we visited, the rainy season had ended a month before, so there was a lot of water in the river. 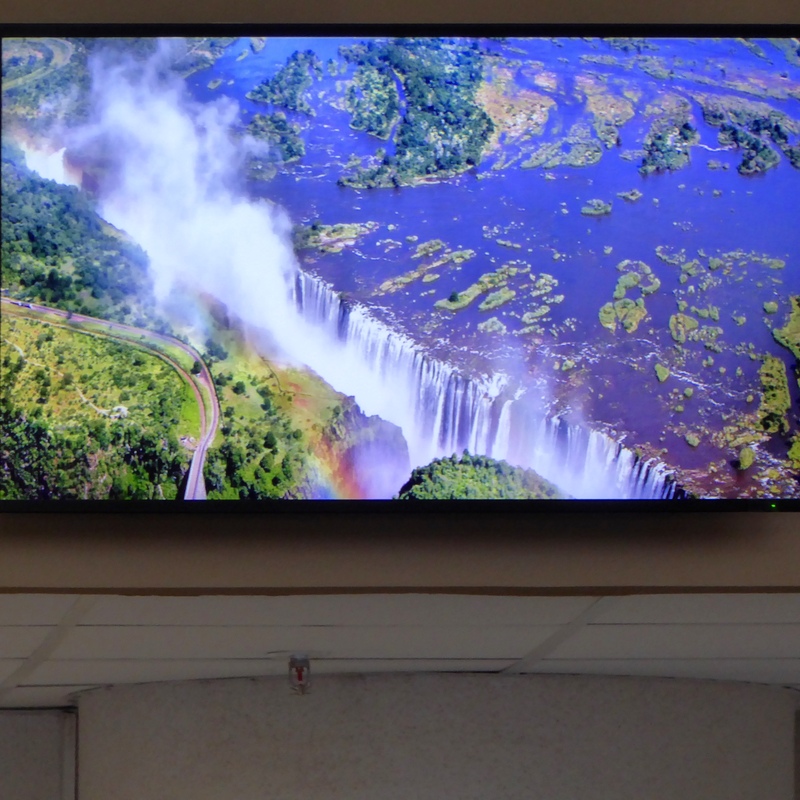 We love all waterfalls and we really love Victoria Falls. 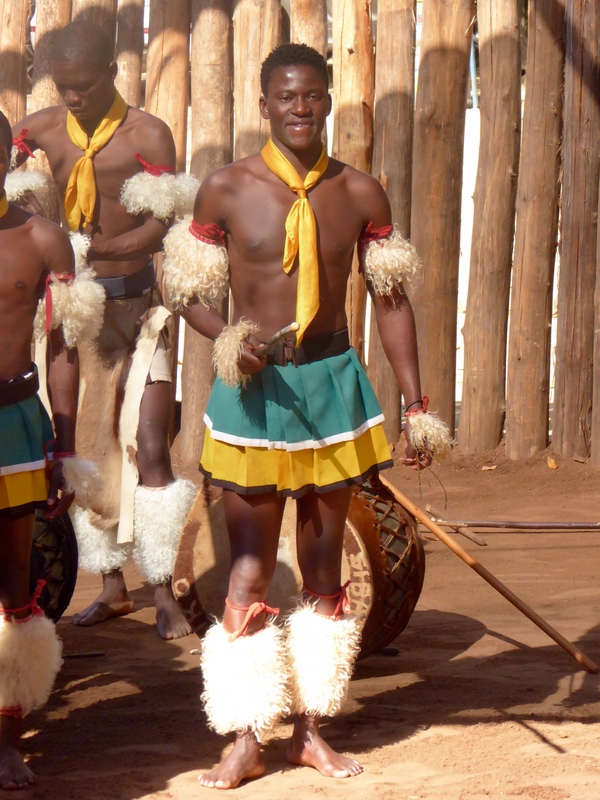 Next week we will show you what we saw from the Zambia of Victoria Falls.